The Vest Project Part 12-6 Hungry Driver-One Bad Marketing Idea. Marketing can be hit or miss. Some marketing ideas might seem great, but backfire horrible. Some marketing ideas might seem horrible and work well. Sometimes marketing ideas work, and sometimes they don’t. 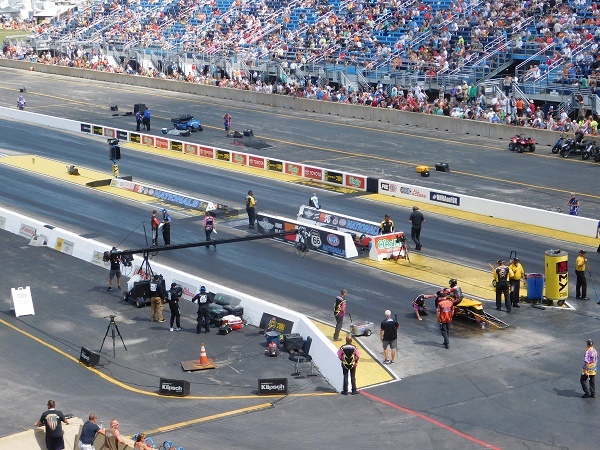 Auto racing is a good strategy for marketing, because it brings in more people, and gives you a great promotional tool, which can bring in revenue. 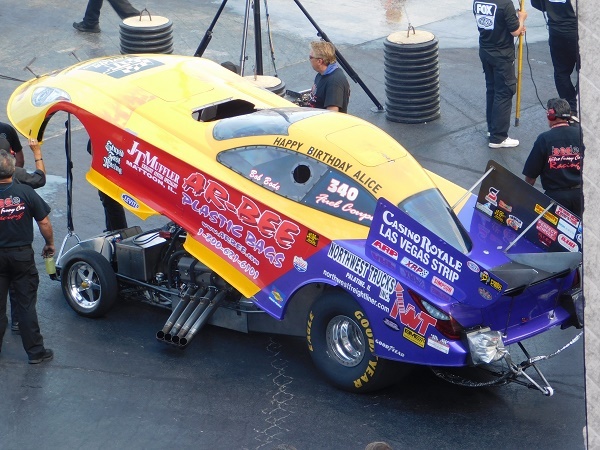 Your car can be made into a die cast, and sold, which will bring revenue, along with t-shirts, hats, coozies, and other such track souvenirs. 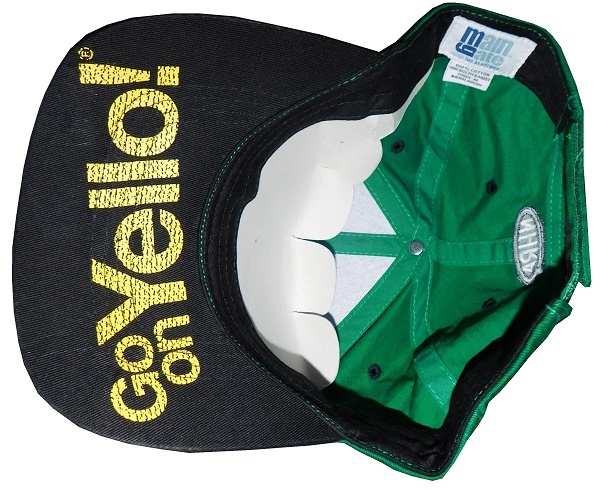 Your driver will promote you while racing for the checkered flag. 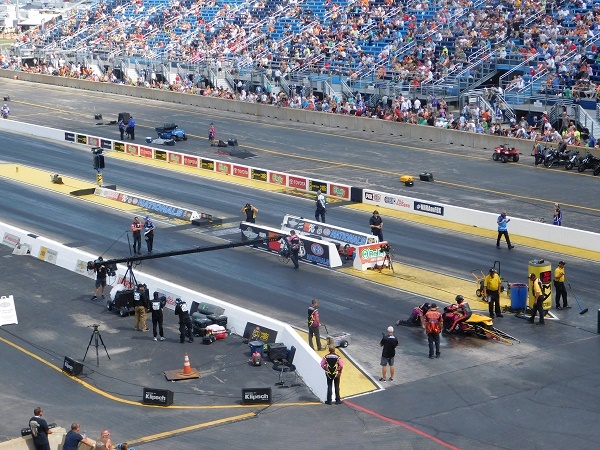 While auto racing might seem like a top hit, sometimes a marketing idea comes along that just takes a great promotional tool, and takes it down to to a horrible one. The 1957 Chevy nonsense is a great example. Another good example that a lot fewer people remember is the 6 Hungry Drivers nonsense from 2005. For those who don’t remember, from 1992 to 1999, Ray Evernham was Jeff Gordon’s crew chief at Hendrick Motorsports. 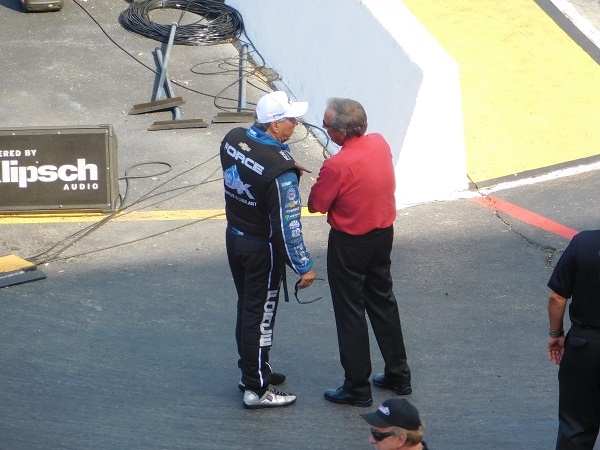 They had previously worked together at Bill Davis Racing, even though the team hated Evernham. When Jeff Gordon joined Hendrick, Evernham joined him. 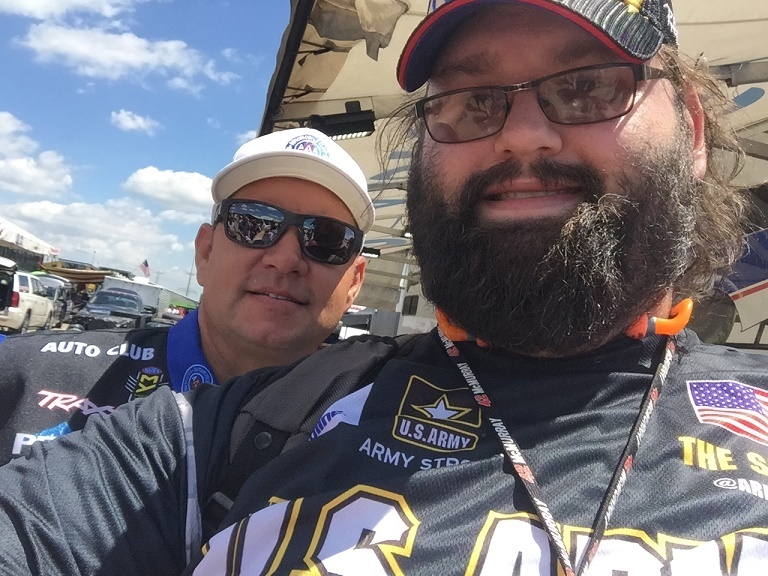 Together, they won 47 of Jeff’s 93 wins, and 3 of his 4 Sprint Cup Championships. 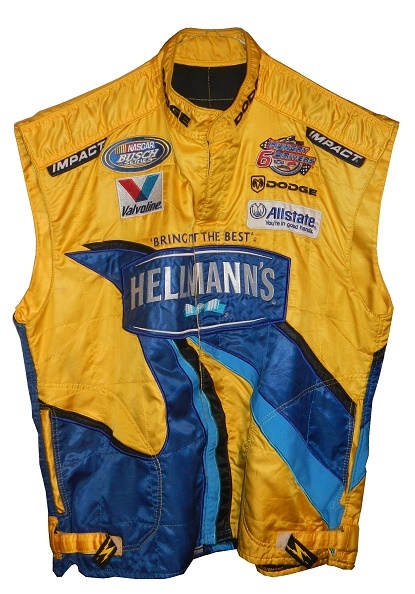 This partnership ended in 1999, when Evernham left Hendrick to pursue his own team, Evernham Motorsports. 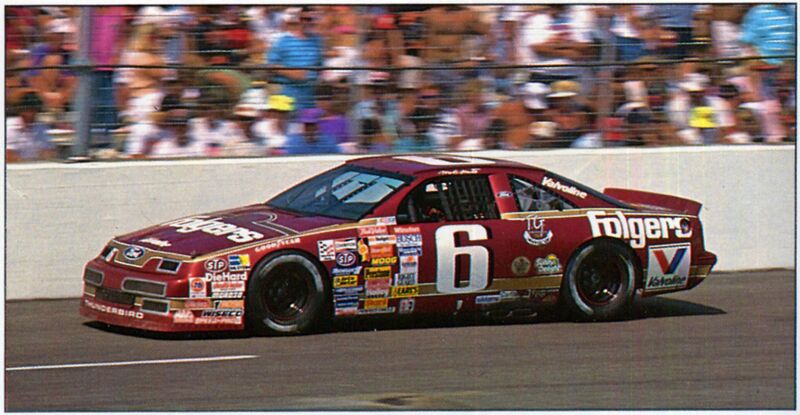 Evernham Motorsports was actually a pretty decent on-track success, with 13 Sprint Cup Wins, 66 top 5’s, and 123 top 10’s. 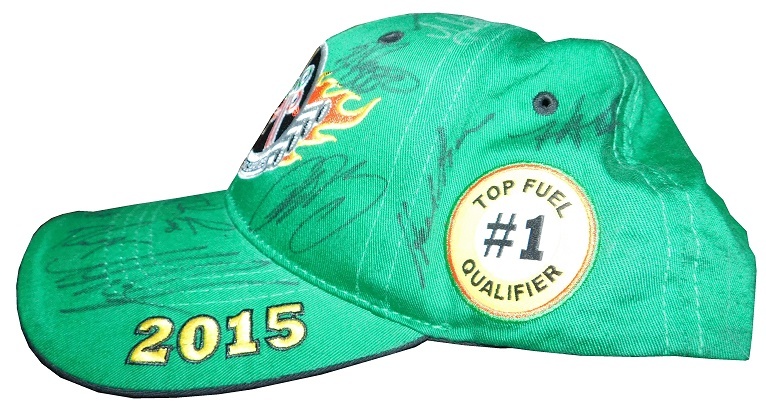 In the Xfinity Series, they had 5 wins, 13 top 5’s and 28 top 10’s. In 2005, they were sponsored by Unilever’s brand line, which includes Ragu, Country Crock Spread, Lipton Tea, and, of course, Hellmann’s Mayonnaise. 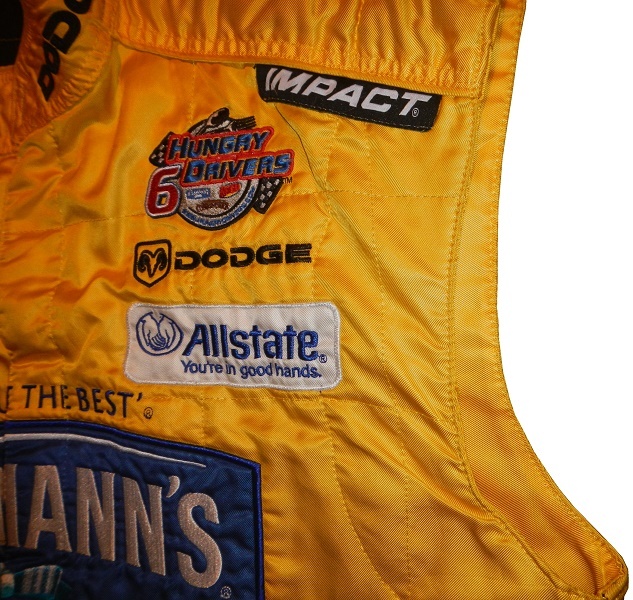 Many of these sponsors were on car #6, and there were 6 different drivers who raced under this sponsorship, Paul Wolfe, Jeremy Mayfield, Mike Wallace, Kasey Kahne, Erin Crocker, and Bill Elliott. 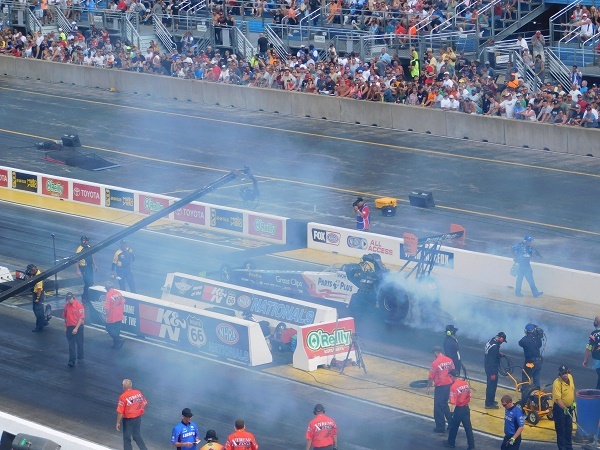 For this line of sponsorship, Someone came up with the bright idea to have “6 Hungry Drivers” as the slogan for this group of drivers. There is no better way to say that a team isn’t going to do well than saying “We have six different drivers who are hungry, since they haven’t found any on-track success at all, so don’t expect a lot from us” than using 6 Hungry Drivers. 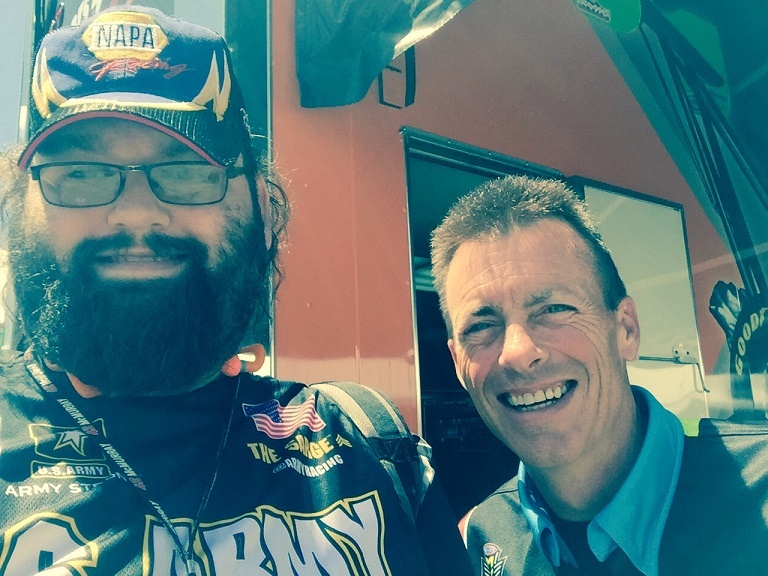 Of those six, Mike Wallace had a top 5, and two top 10’s, Paul Wolfe found a top 10, as did Jeremy Mayfield. 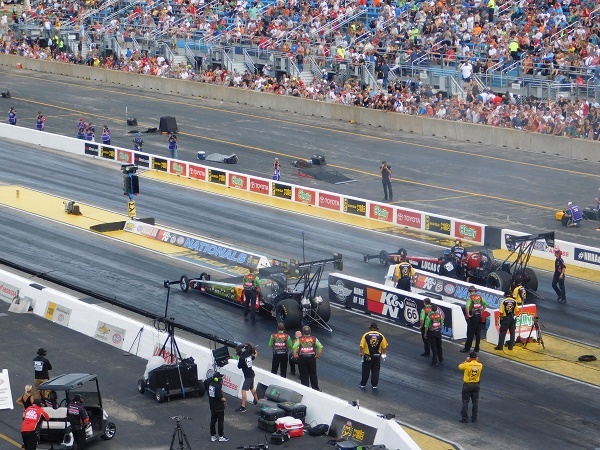 The star standout was Kasey Kahne, who was really hungry, earning a win, three top 5’s and three top 10’s. Granted that not all of them came for the #6, but he really was hungry. 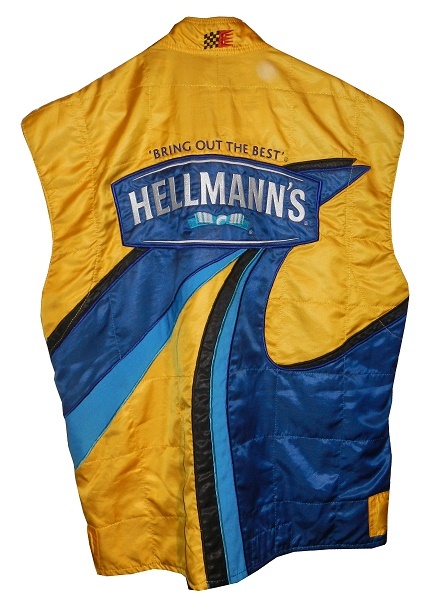 For the races that these six drivers raced, this Hellmann’s Mayonnaise vest was produced. 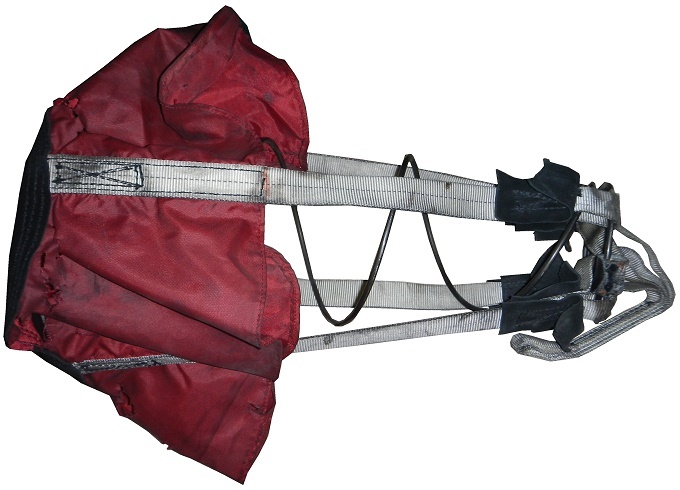 The vest itself shows some use, albeit light use. 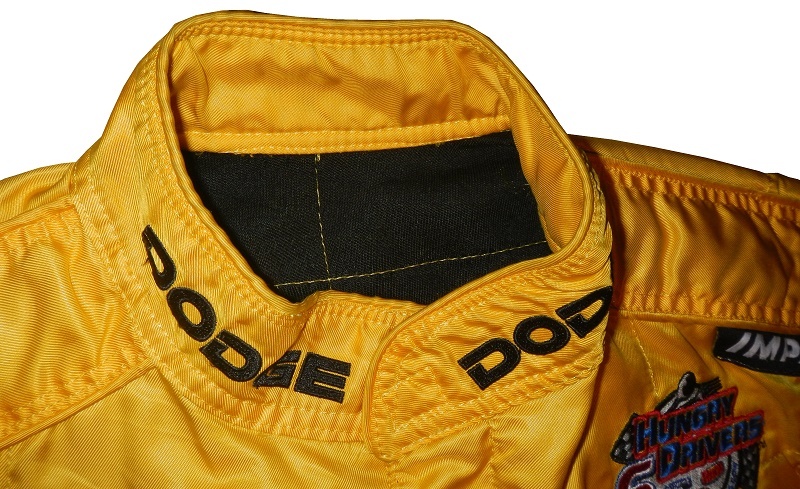 The collar has black DODGE logos on the yellow material. 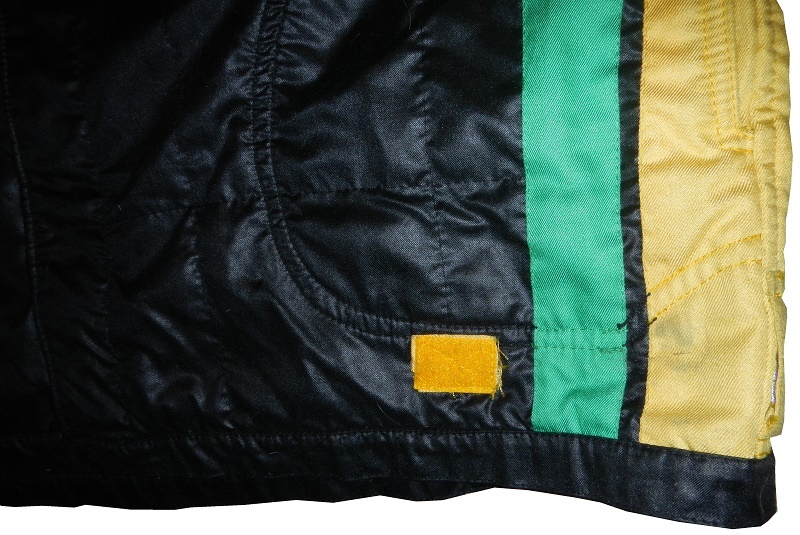 I’ve also noticed the black internal material which I haven’t seen that much in racing suits. 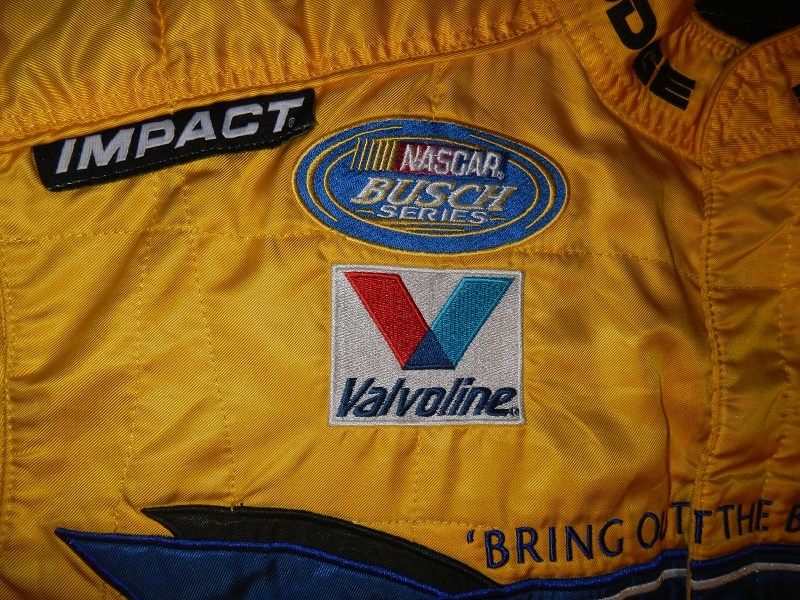 The right chest sports NASCAR BUSCH SERIES and VALVOLINE logos. 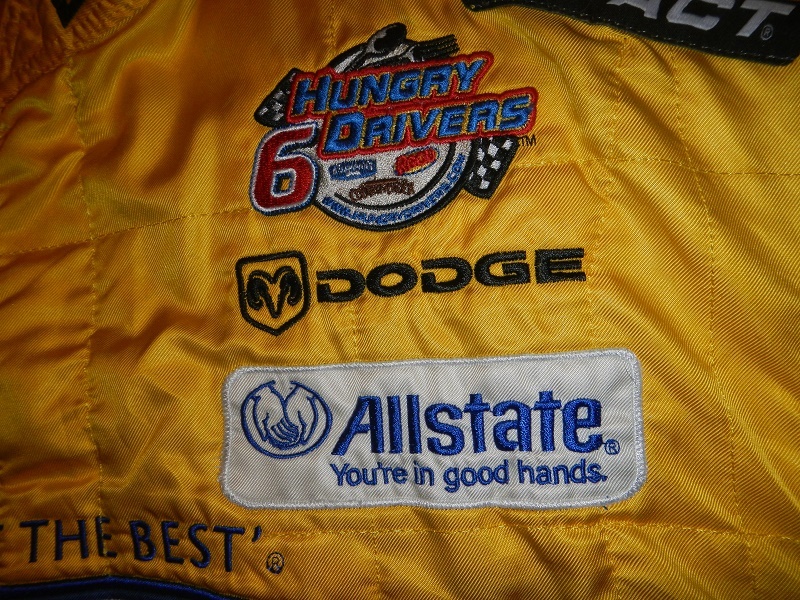 On the left chest, 6 HUNGRY DRIVERS, DODGE, and ALLSTATE INSURANCE logos have been placed. 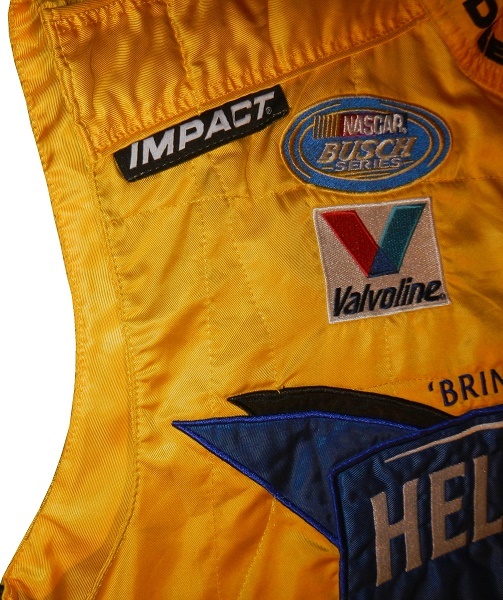 A large HELLMANN’S logo is present on the front torso, along with some odd blue striping. 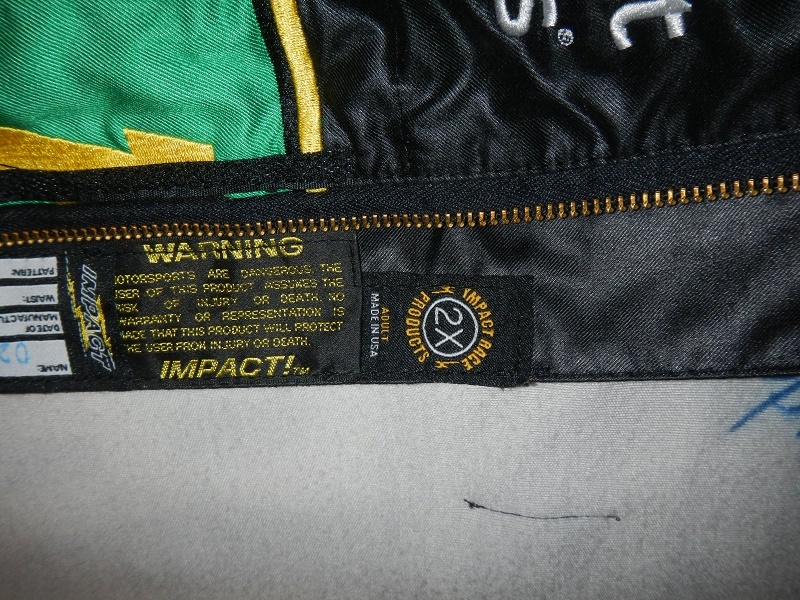 The Simpson warranty label is present inside the vest, behind the main logo, next to the zipper. There is an identification label, but that is in a different location. 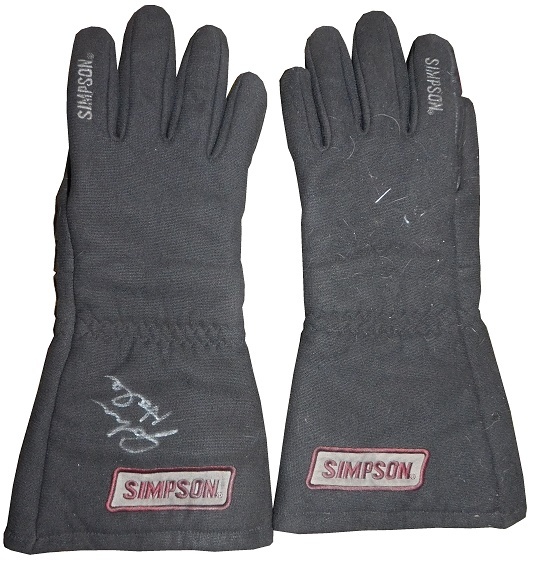 Unlike later models, this early Simpson vests sports comfort straps. 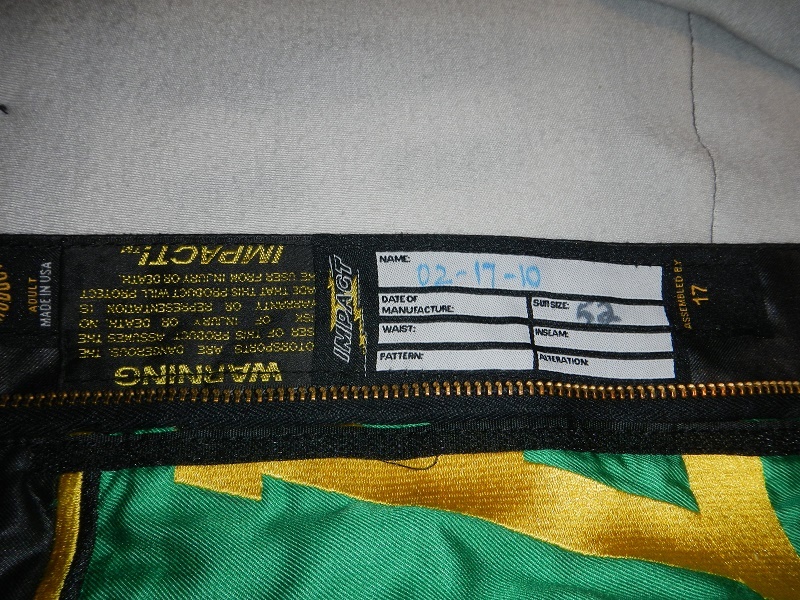 Also unlike later models there is an identity tag…in the tail, as opposed to next to the warranty label. The name TOOD D is written in Sharpie, but no date has been written. 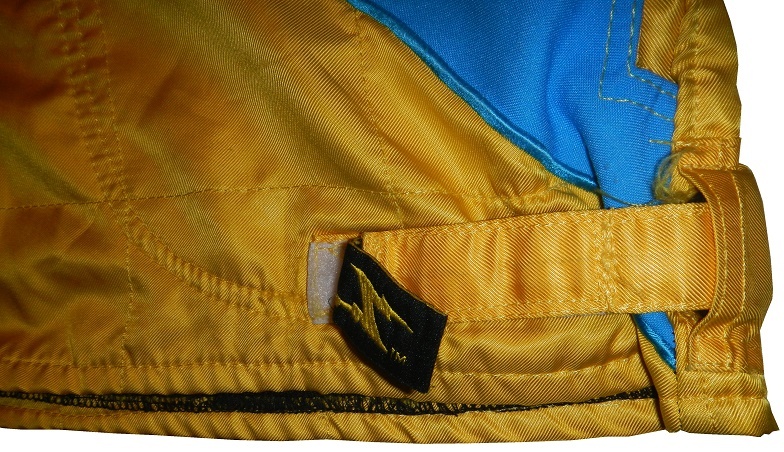 The shoulders have yellow epaulets, which are unadorned. 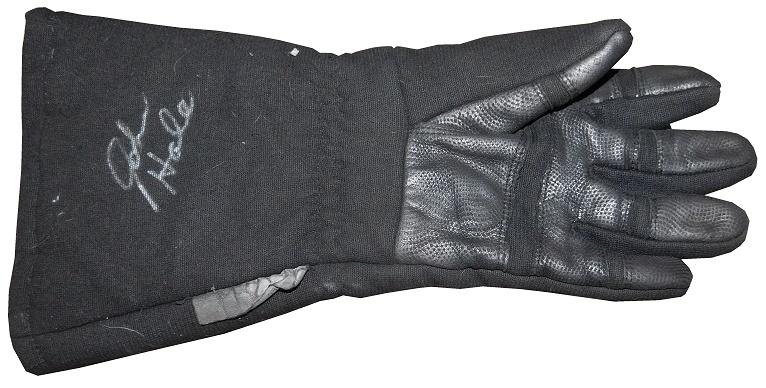 The standard vest sleeve-holes are present as well. 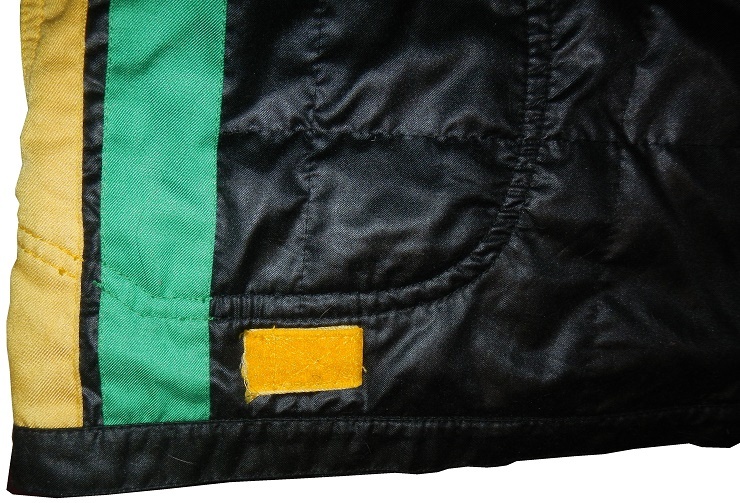 The back of the vest shows some light wear. 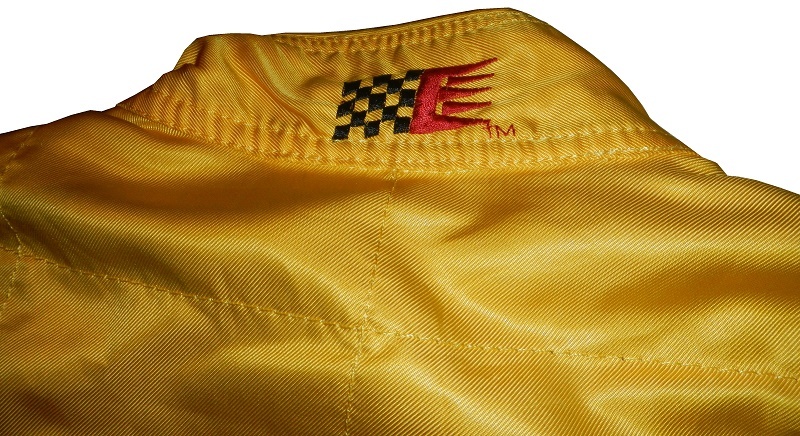 The back of the neck sports an Evernham Motorsports logo. 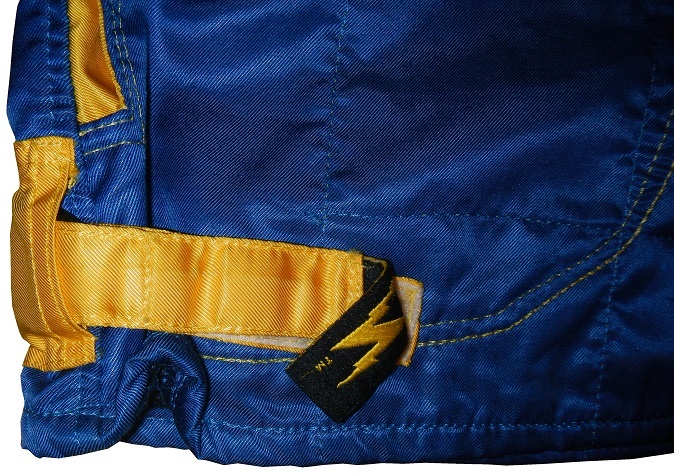 The back logo features a HELLMANN’S logo, along with the same odd blue stripe, though in reverse. 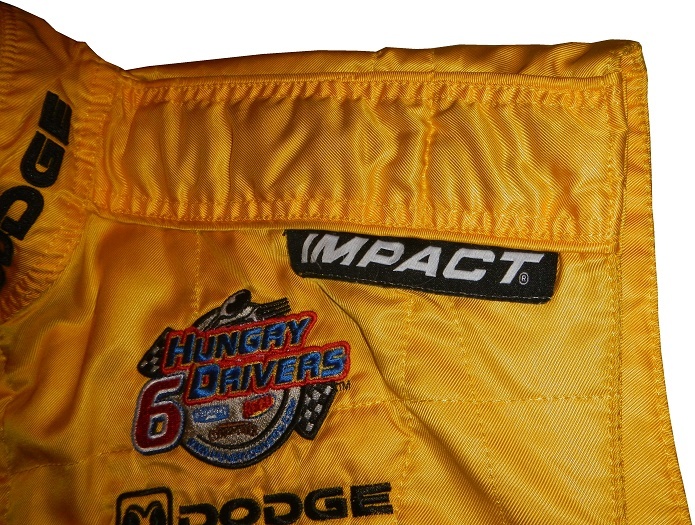 The 6 Hungry Drivers promotion was a bad idea from the start, and it didn’t last past 2005. Evernham Motorsports didn’t last much longer. 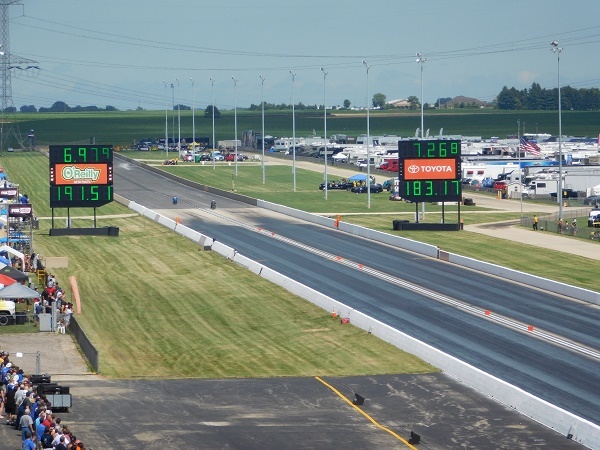 In 2007, George N. Gillett Jr. bought a stake in the team, and the team became Gillett Evernham Motorsports. The team lasted until 2009, when it was bought by a new team, and both Evernham and Gillett left the team, thus leaving Richard Petty Motorsports. Next week, I return from my vacation, I will bring back My Thoughts On, the Paint Scheme Grades and the Paint Scheme Tracker. 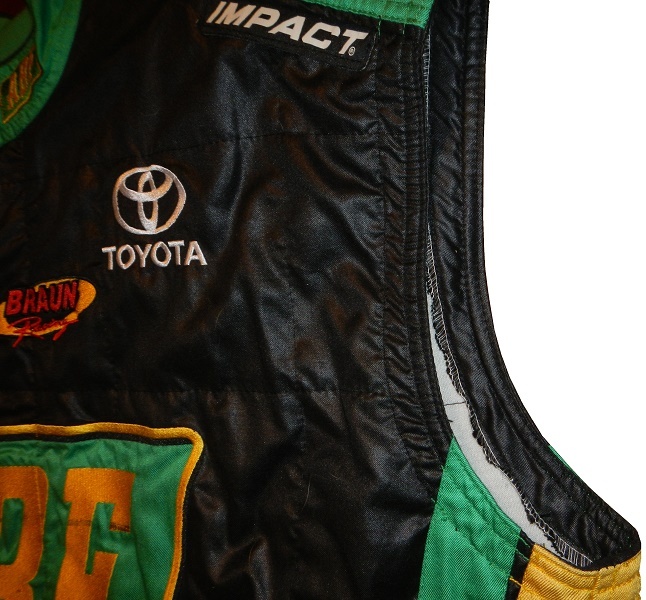 Also we will look at a vest from the true definition of a home-grown team. The Vest Project Part 11-ABF…and I’m NOT Referring to Antibiotic Free! 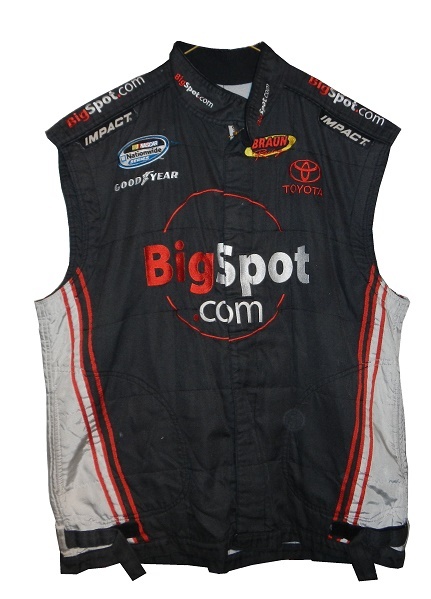 Last week I discussed a vest with a small-time sponsor, this week we’re going bigger. Founded in 1923, Arkansas Best started with humble origins as a local freight hauler. 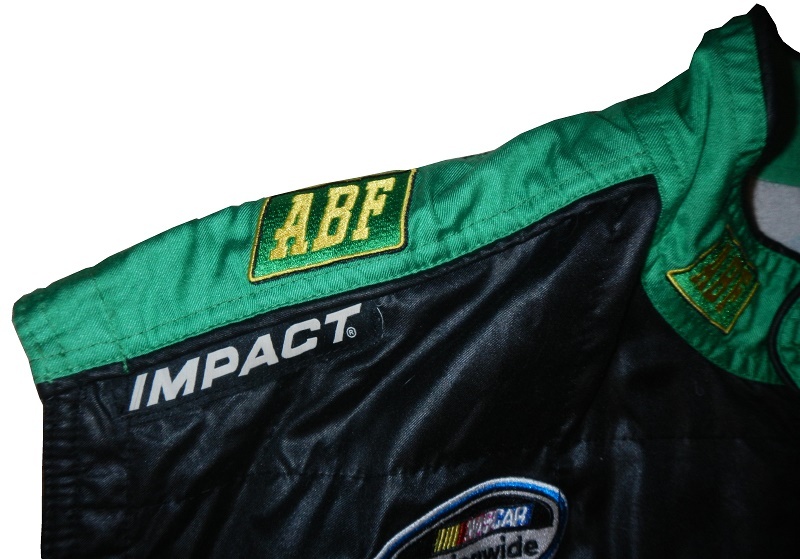 As time progressed, ABF became bigger, and has gone from a local hauler based in Fort Smith, Arkansas to a large global shipping force. A few employees have grown to over 10,000, and a few thousand dollars have turned in to over a $1 billion. Like many shipping companies, ABF has had to deal with bad economies, and increased completion. 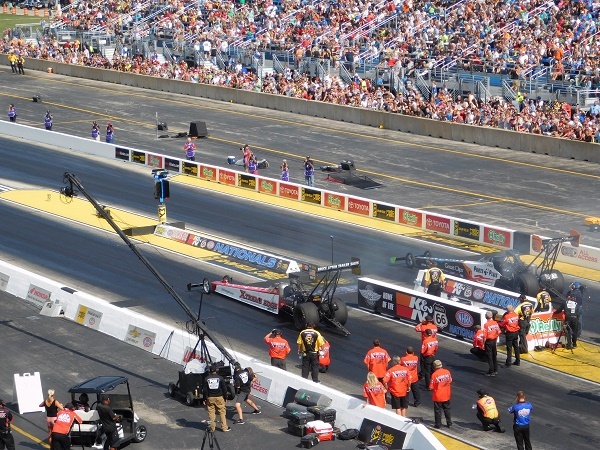 Also, they have turned to auto racing sponsorship to increase promotion, and gain attention. 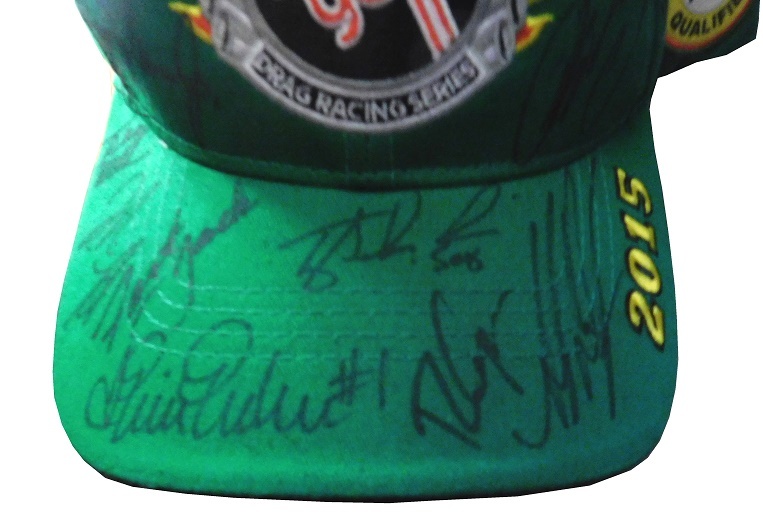 While they were never seen in the Sprint Cup, they did get a decent amount of exposure in the Xfinity Series for, of course, Braun Racing. 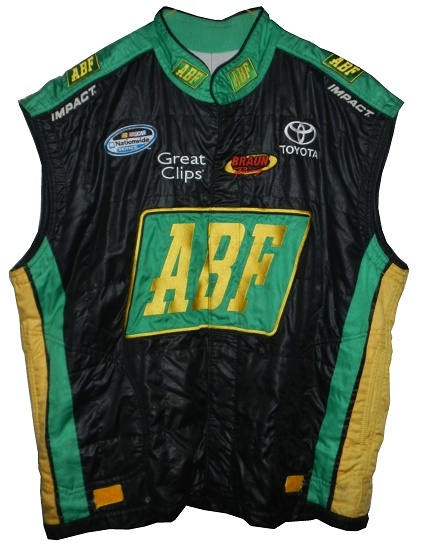 ABF’s sponsorship goes back to 2008, where they raced a number of different races for several different drivers. 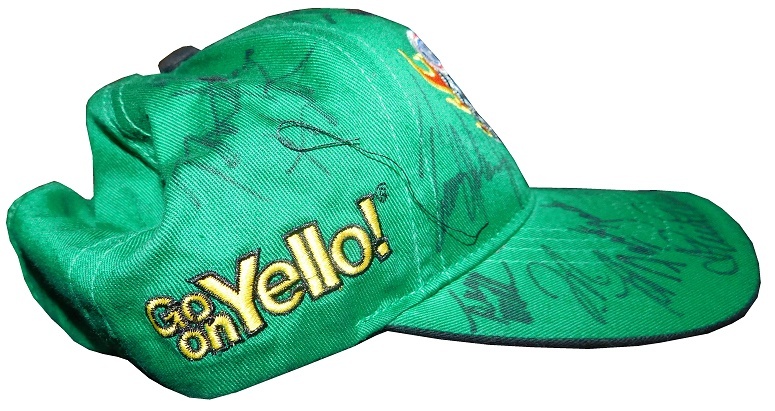 They left in 2009, but made a return in 2010, and 2011 between drivers James Buescher, and Jason Leffler. 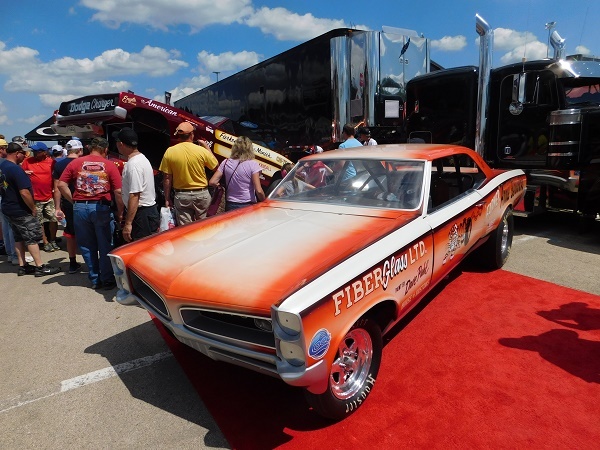 Lefler raced 7 races with ABF on the car, and had 2 top 5’s and 5 top 10’s in 2010. Buescher raced 4 races and had a top 10 in 2011. 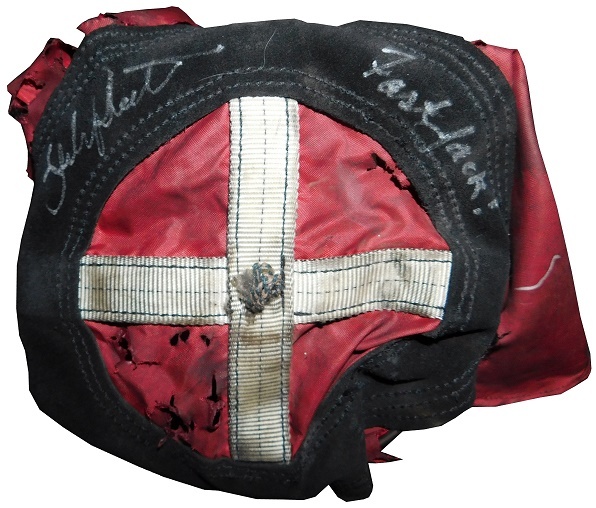 For those races, a large crew member with the nickname “Poptart” was issued this Impact size 2XL vest as a part of a three-piece crew suit. 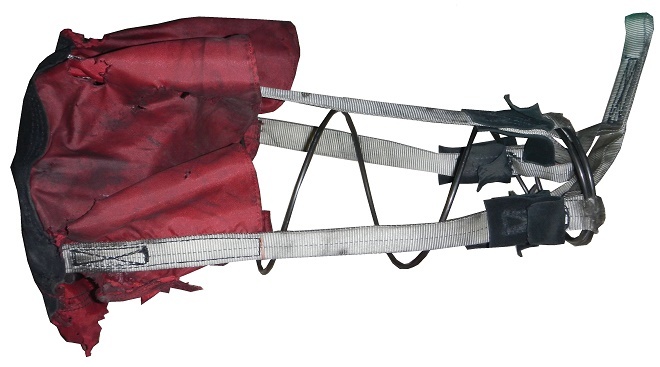 The vest shows some light use, not shocking, given that it was used for 12 races in 2 years minimum. 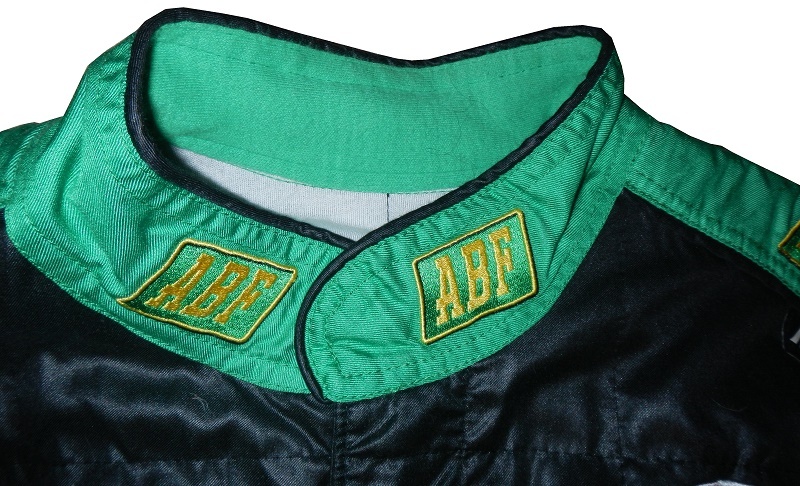 The green collar has yellow ABF logos embroidered, which are difficult to see given the shade of green used. 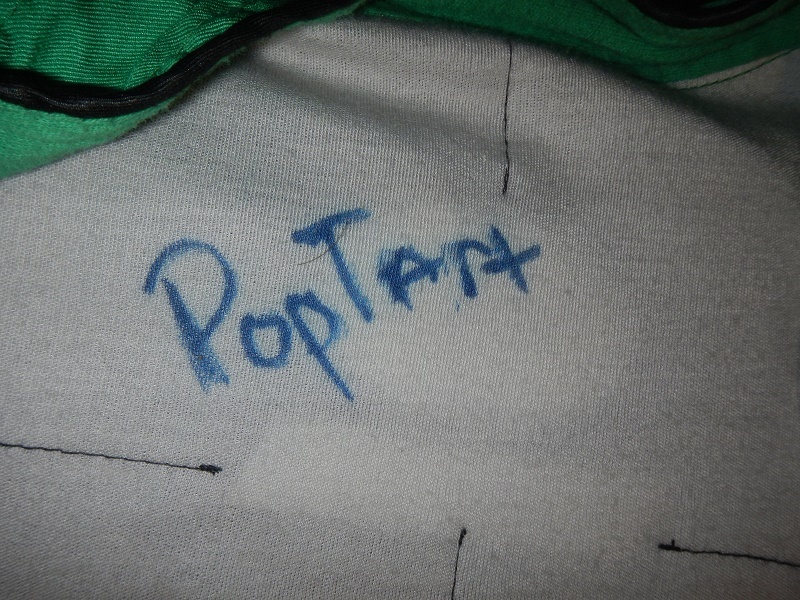 The name Poptart is written on the inside in blue Sharpie. 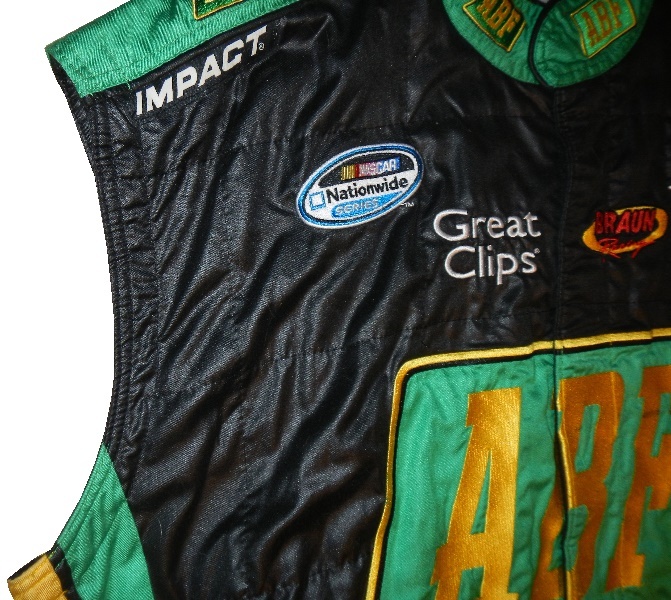 Embroidered in the right chest are NASCAR NATIONWIDE SERIES and GREAT CLIPS logos. 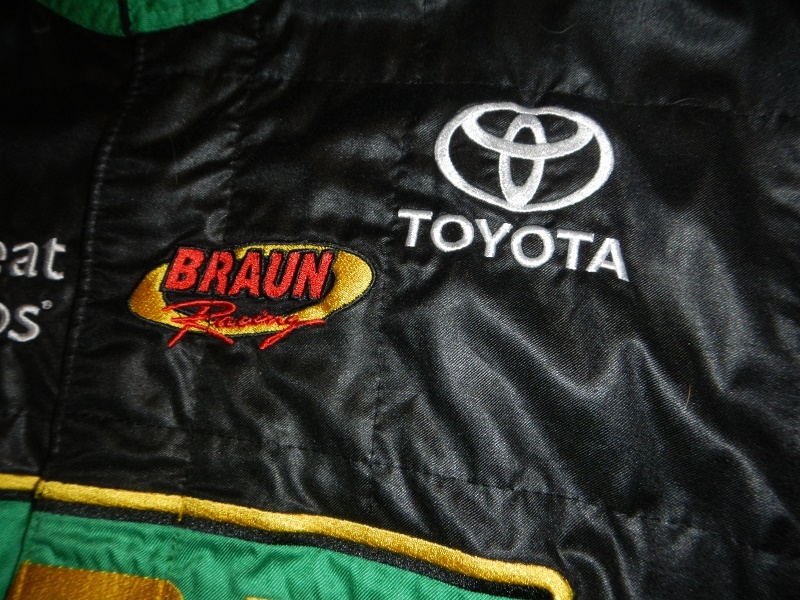 The left chest features BRAUN RACING and TOYOTA logos. 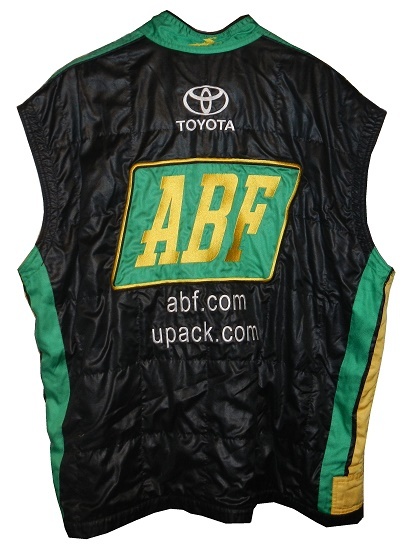 A large ABF logo is embroidered in green and yellow is present on the front of the suit. 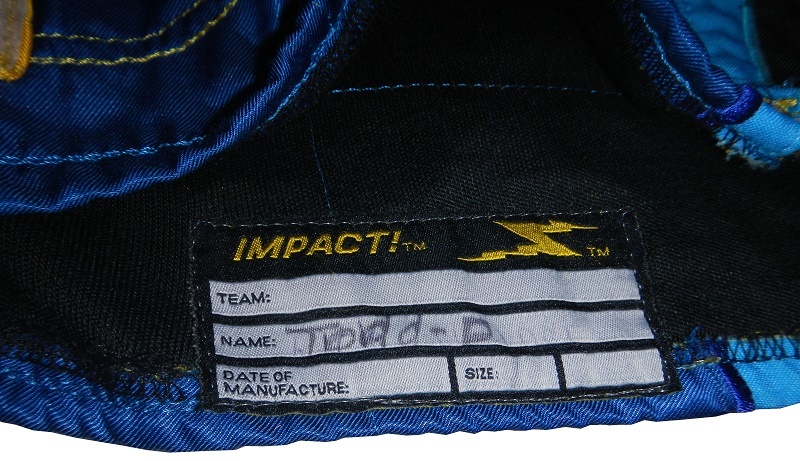 The standard Impact warranty label and identification label is present next to the zipper, behind the main logo on front. 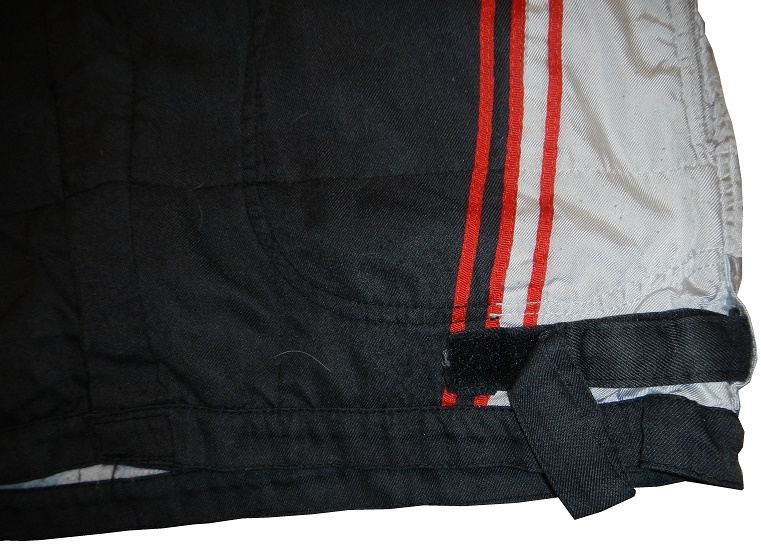 The comfort straps are present on the sides of the hem. 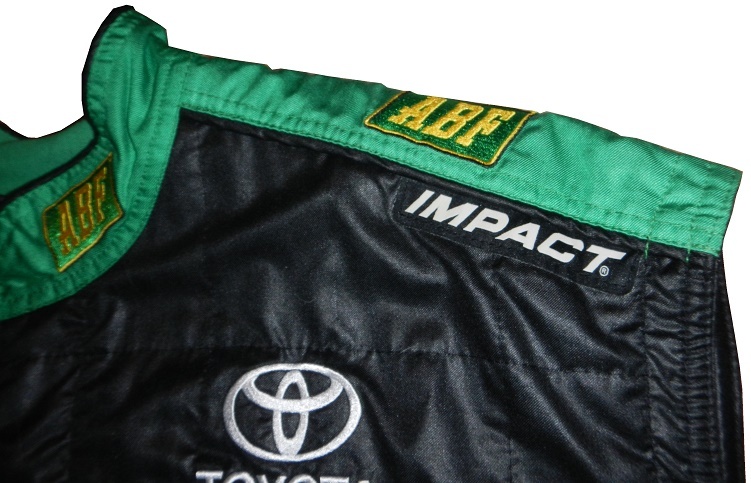 The shoulders have green epaulets with yellow ABF logos on them, as well as Impact logos. 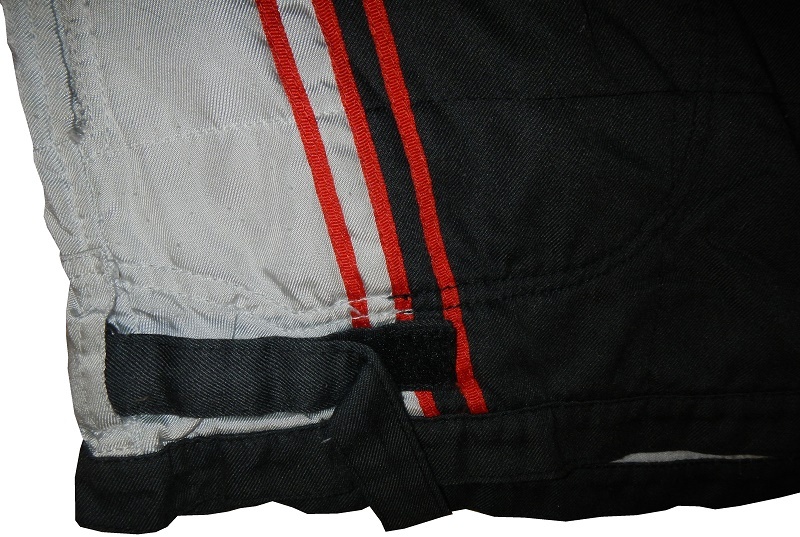 The standard vest sleeve holes are present as well. 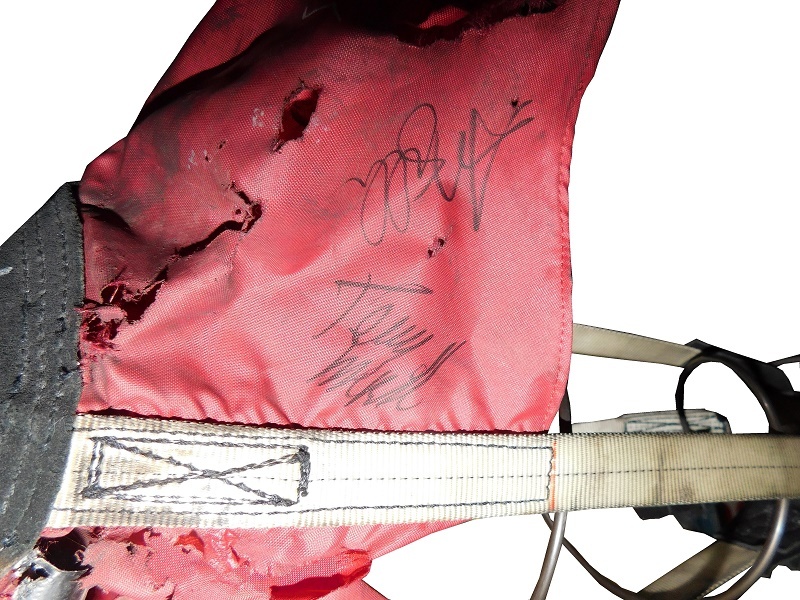 The back of the vest doesn’t really show any wear. 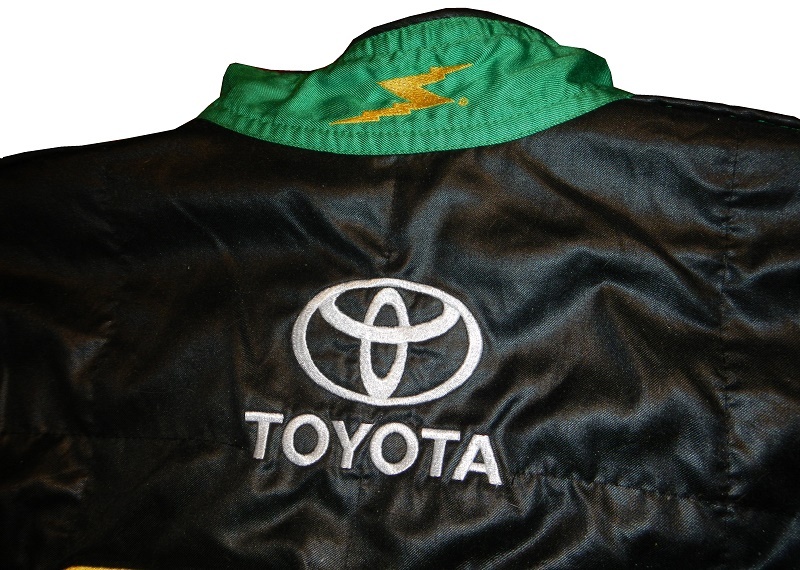 The back of the neck has a yellow Impact Z logo on the collar itself, and a white TOYOTA logo below it. 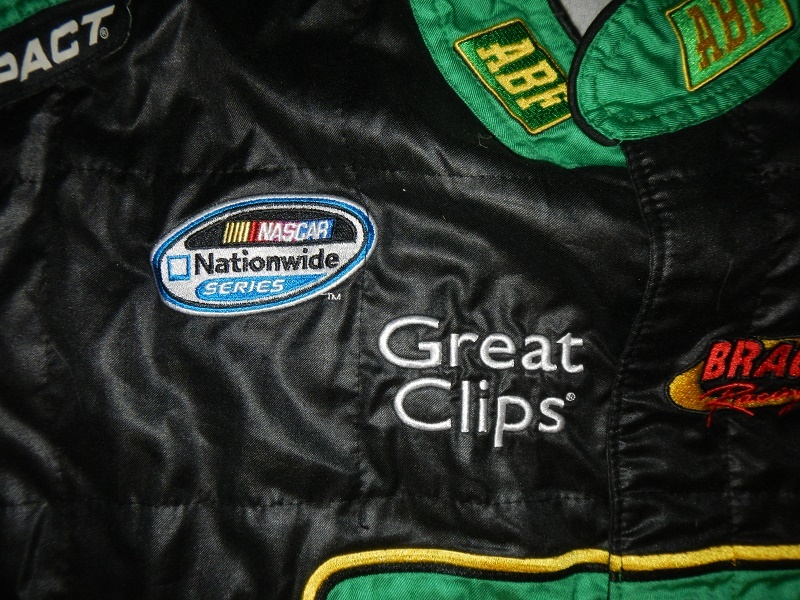 The back torso has the same ABF logo as the front, though somewhat higher, and ABF.COM and UPACK.COM embroidered into it. 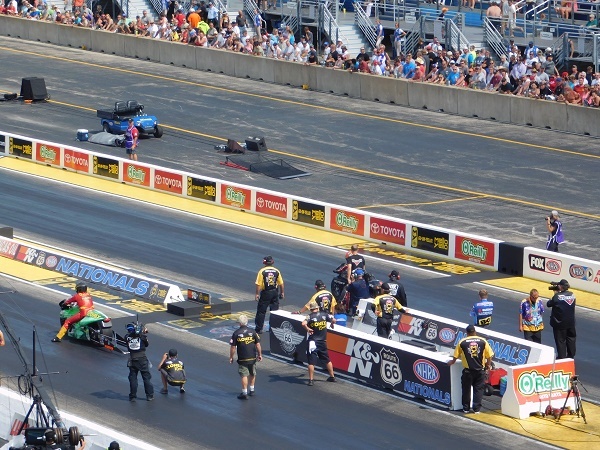 Though Braun Racing had a good run, it would come to an end in at the end of 2010, when it merged with Turner Motorsports. The team would have some more glory before fading away in 2014. Next we will discuss a vest with a bad marketing idea, used by a team with that met an even more inglorious end. 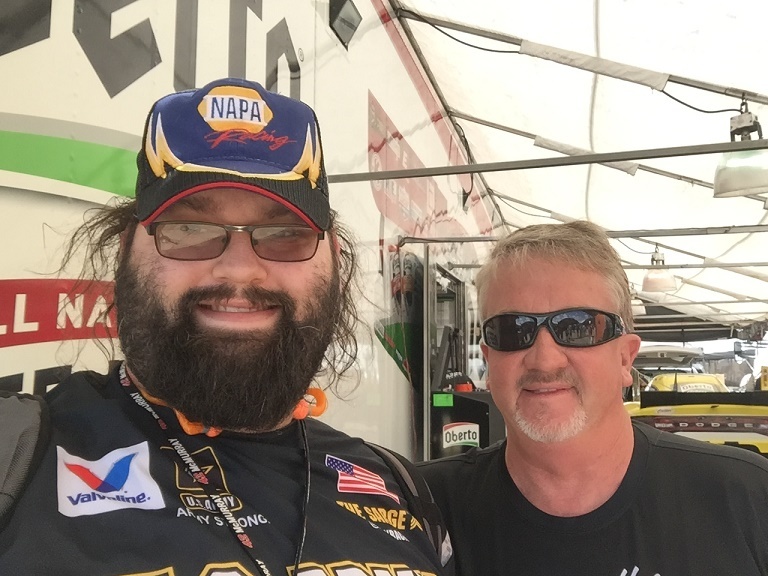 Let me make this clear, we are done with Braun Racing and Turner-Scott Motorsports for the time being! Pennzoil returns, this time on Michael Waltrip’s 1991 Pontiac Grand Prix. 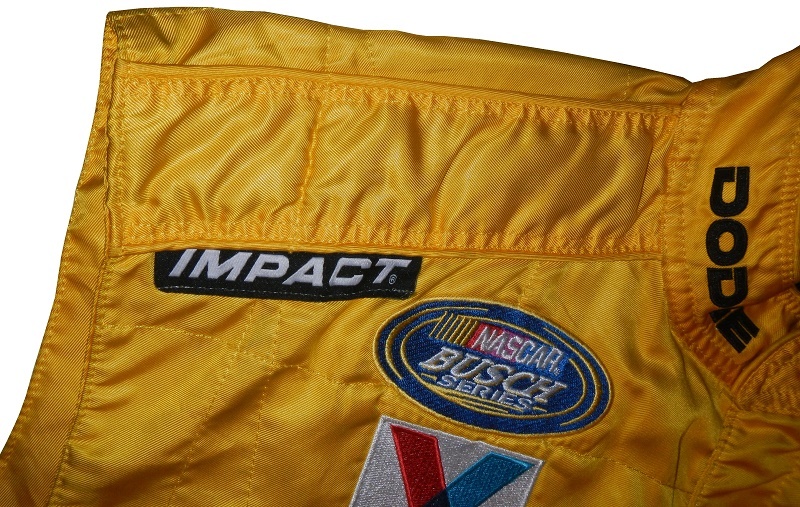 I’m weirdly particular about shades of yellow in NASCAR. I don’t get upity about any other color as much as I do about yellow. It’s a hard color to have as a base color, because if the shade is too bright, as visible as it is, it just doesn’t look good. That said, this particular shade is bright, but not too bright, and it’s unique. It looks really good. I like the red door numbers too. The logo getting cut off by the wheel well annoys me, not just this car, but race cars in general. It’s visually distracting, and doesn’t look good at all. This is a really good look, and a really good car. Andy Santerre 1999 press kit is examined this week. To say our country has had a dark week would be an understatement. Between the senseless deaths of Philando Castile in Falcon Heights Minnesota, and Alton Sterling in Baton Rouge, Louisiana, and the Dallas Police Officers who were senselessly gunned down by a madman, our country has had a dark cloud hanging over it for a week. 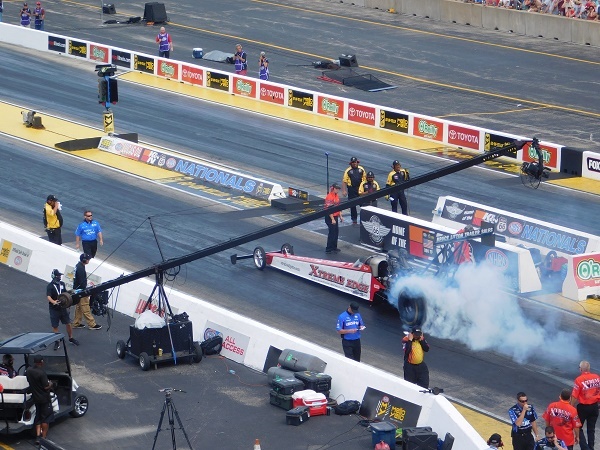 Sadly, not even motorsports could escape from this dark cloud, as long time Champ Car owner Carl Haas, of Newman/Haas Racing, and long time funny car driver Chuck Etchells also passed away this week. 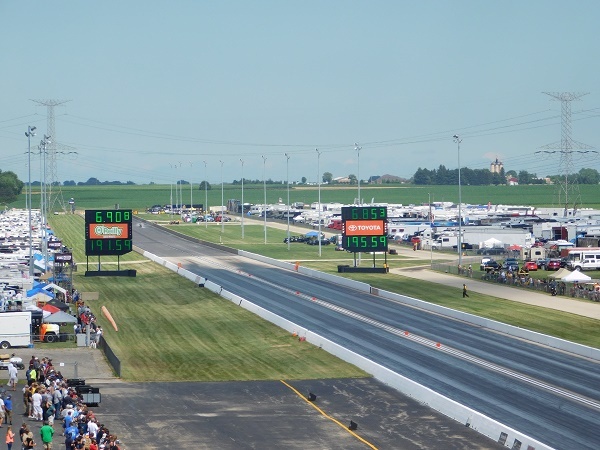 These dark clouds were all around myself and the rest of the country, but for Chicago area motorsports fans, the dark clouds lifted over Route 66 Raceway, where the K&N Filters Route 66 Nationals took place this last weekend. I went on Saturday to the event, and I had a great time as I always do. It’s become my annual summer tradition. 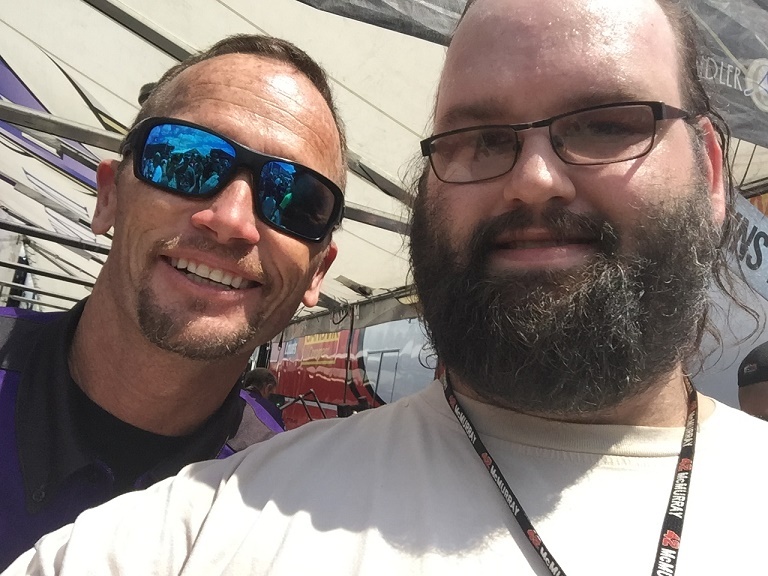 I praise the NHRA for being about the fans, and though I disagree with some of their recent decisions, the fan experience at the track is great! 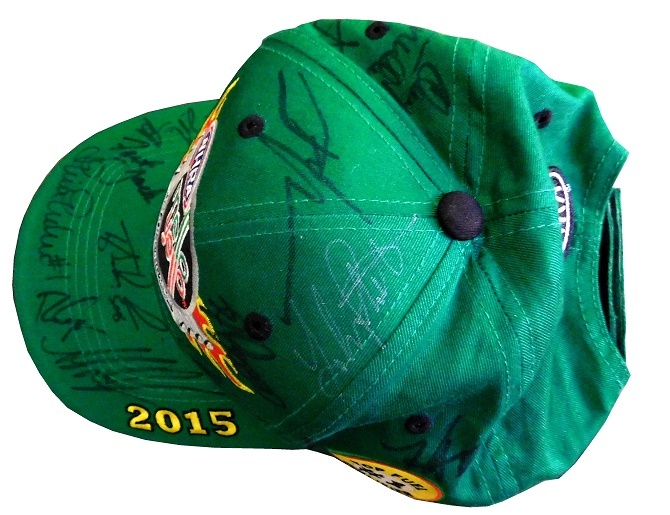 Fans can meet the drivers, get autographs, get pictures, for no extra cost, other than ticket price. 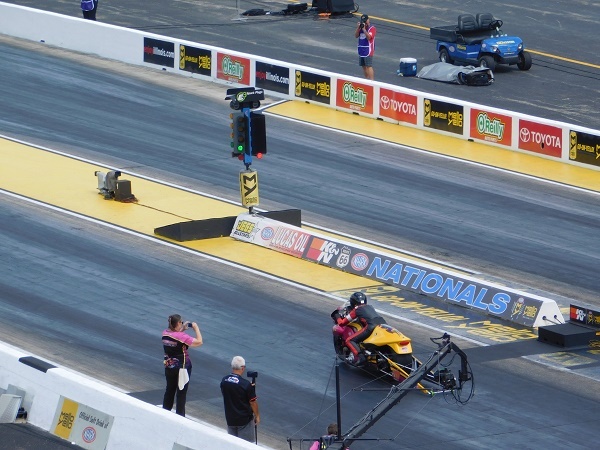 No other form of racing that I’m aware of allows this, at least not on the national level, for free. It’s a great value, and a fun way to spend the day! 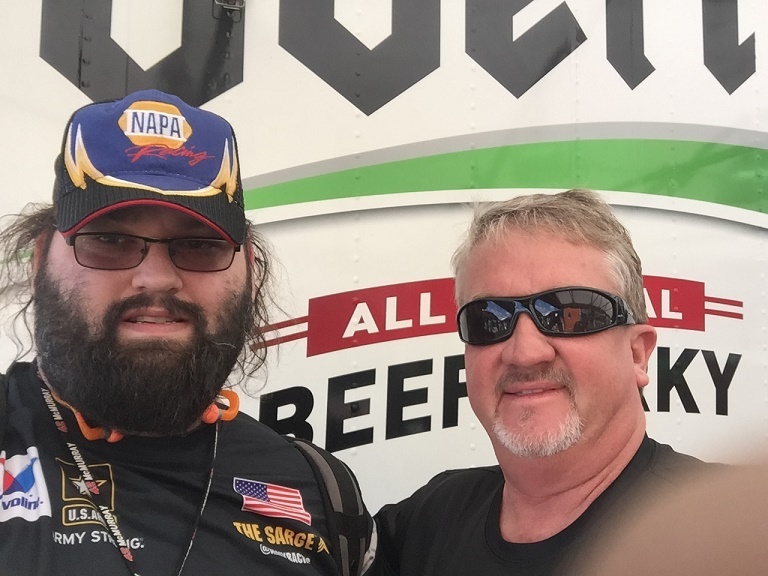 I spent most of my time getting autographs and meeting drivers. 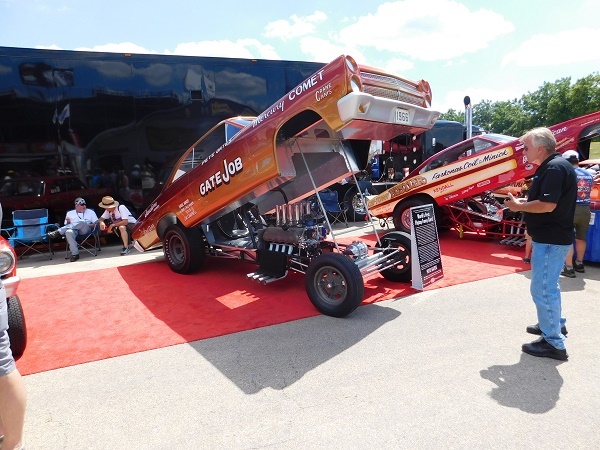 2016 marks the 50th Anniversary of the Funny Car class in the NHRA, and there were four beautiful vintage funny cars on display. 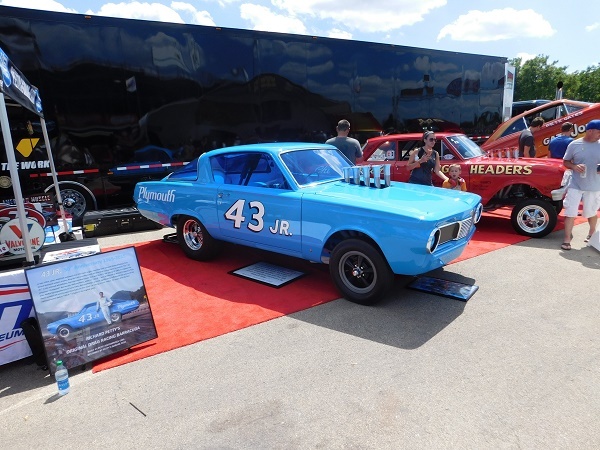 The first of which is the “43 Jr.,” a 1965 Plymouth Barracuda which Richard Petty raced in 1965 and early 1966, after NASCAR banned Plymouth for their successful Hemi engine, One of the first flip-top Funny Cars, Pete Gates 1966 Mercury Comet “Gate Job,” The legendary “Chi-Town Hustler,” a 1969 Dodge Charger and Arnie “The Farmer” Bestwick’s 1966 Pontiac GTO. These are four very beautiful cars, in the perfect setting imaginable. 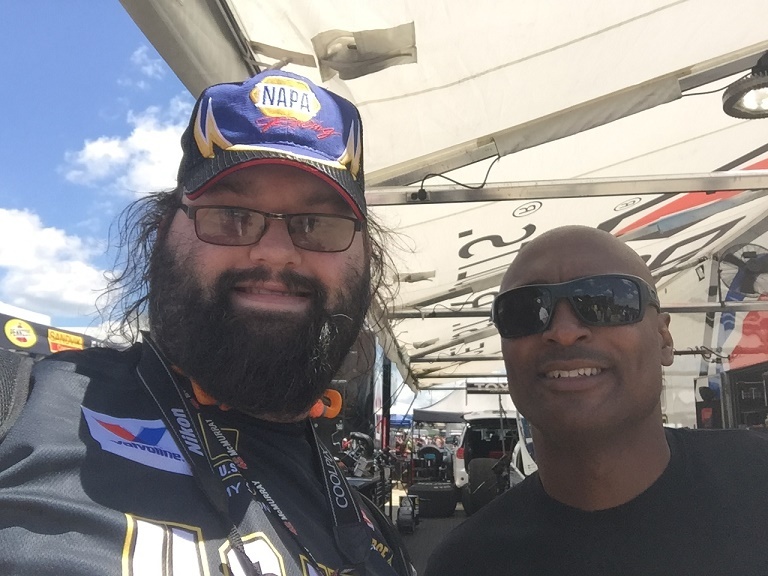 As I’ve discussed on The Driver Suit Blog in months past, I’m against taking selfies, unless there is a reason to take them. 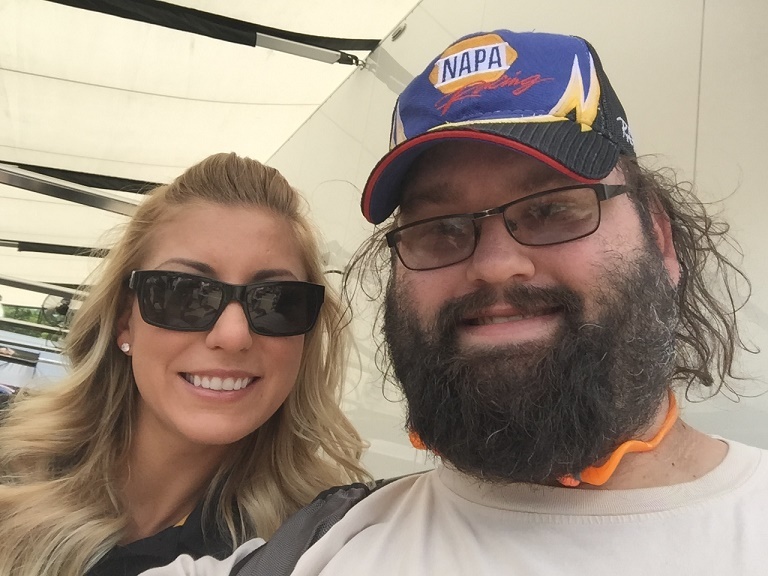 I consider meeting race car drivers a very valid reason to take selfies. 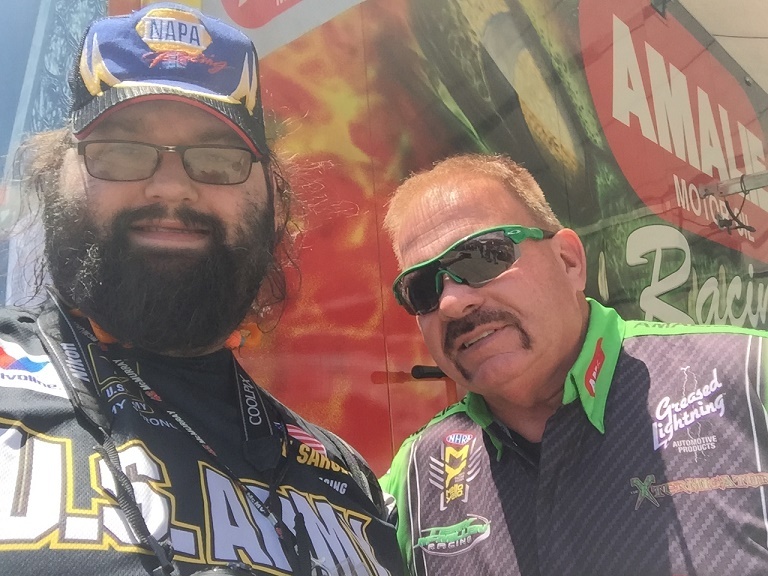 There are drivers I like who I didn’t get the chance in years past, and I decided to get those selfies, and while I didn’t get every one I wanted to, I did get: John Hale, Antron Brown, Terry McMillen, Hector Arana Sr. and Hector Arana Jr., Clay Millican, Angelle Sampey, Robert Hight, Leah Pritchett, and perennial Driver Suit Blog favorites TJ Zizzo, and “Fast” Jack Beckman. 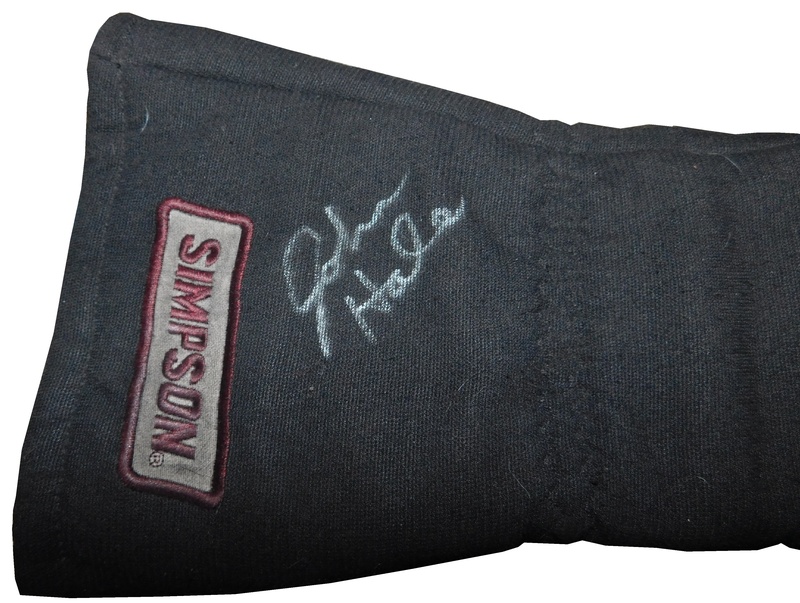 As is the case with these events, I brought items to get autographs on. 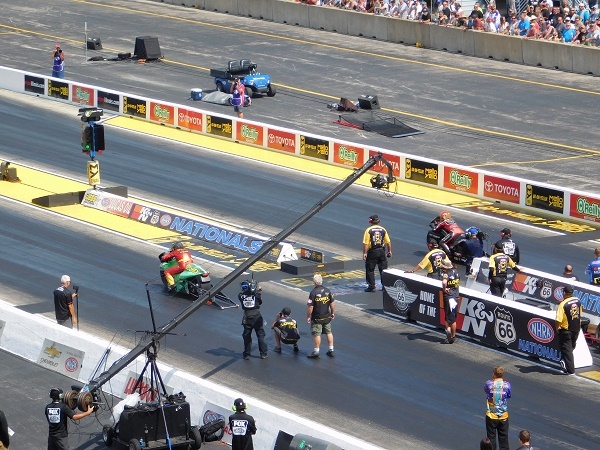 I brought my TJ Zizzo pilot chute, and got Hector Arana Sr., Hector Arana Jr., Clay Millican, Terry McMillen, Leah Pritchett, and Jack Beckman. 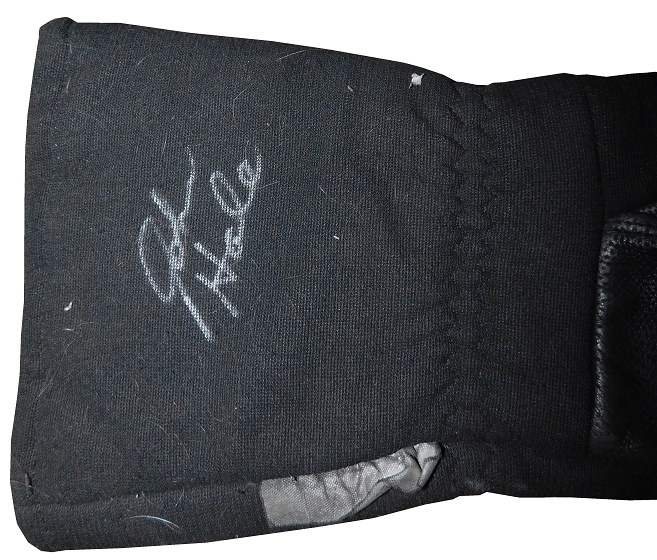 I brought a pair of John Hale Gloves, and got them signed by him. 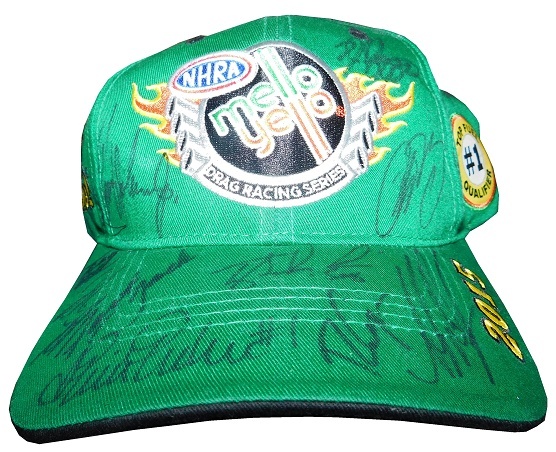 Finally, I brought my Bristol #1 Qualifyer hat, and got it signed by John Hale, Antron Brown, Terry McMillen, Hector Arana Sr. and Clay Millican, Hector Arana Jr., Angelle Sampey, Robert Hight, Leah Pritchett, and perennial Driver Suit Blog favorites TJ Zizzo, and “Fast” Jack Beckman. If you have a chance to make it to an NHRA National event, I suggest you go, it’s worth the trip, and worth the tickets! 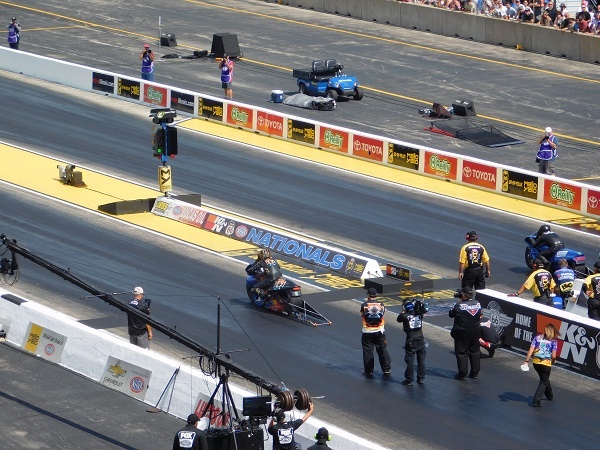 One last thing, I learned before I went to the track that my favorite Pro Stock driver V Gaines decided to retire from racing, because the fun has gone away for him. I’m sad, I liked Gaines a lot, and he will be missed dearly. 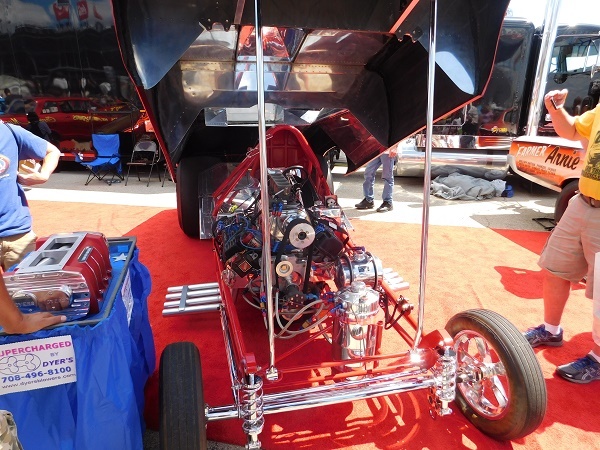 On behalf of the NHRA fans…YABBA DABBA DOO, old friend, YABBA DABBA DOO! 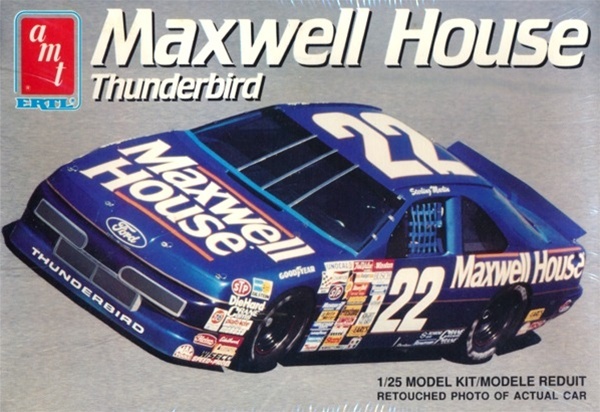 The best driver to never win a championship Mark Martin races in his 1991 Folgers Ford Thunderbird this week. Red, metallic gold, and white is always a great combination. I think metallic gold should be used more on race cars. The two-stripe design works well, but I don’t like the fact that the top stripe is interrupted by the window. 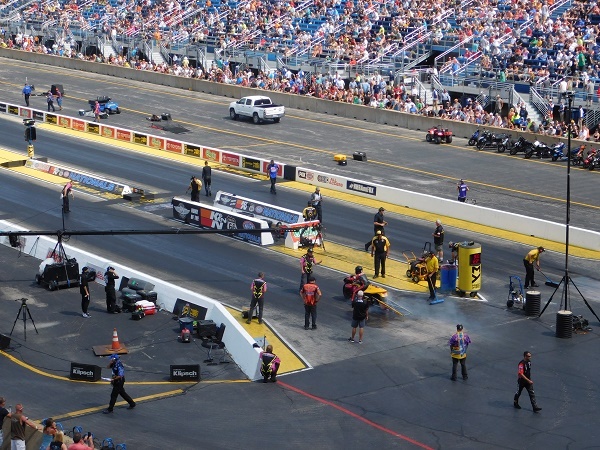 The Folgers logo cut off by the wheel well, and fuel intake is annoying, and the over-sized Valvoline logo looks a little out of place. I also don’t like the black drop shadow on the white door number. A decent scheme, but there is a lot that can be improved it. 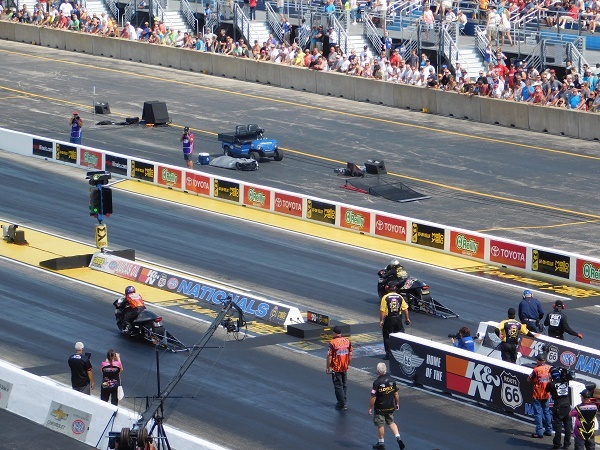 The Power Team is a group of driver sponsored by Peco Energy. 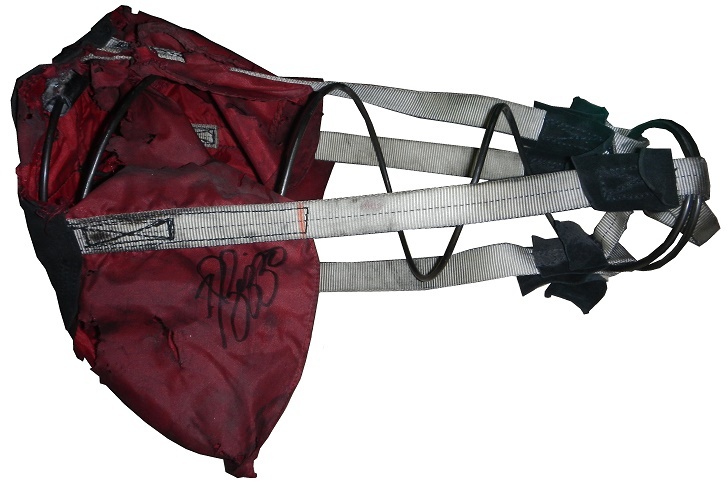 This particular kit was issued for Joe Bossey. 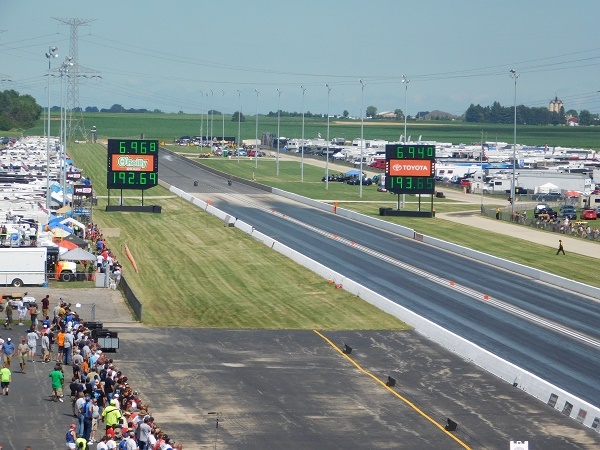 Winamac, Indiana doesn’t seem like that big of a racing community. 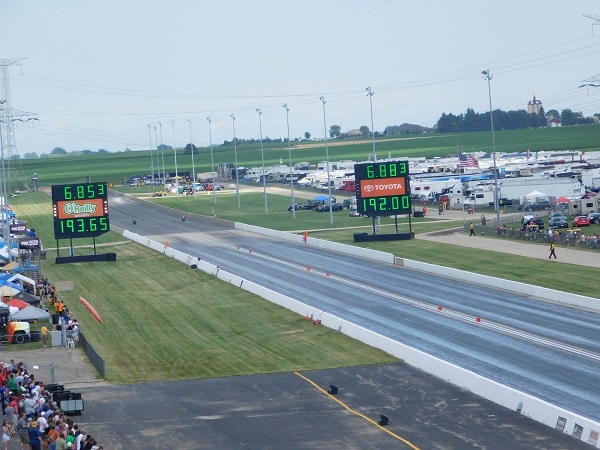 A small town of 2,490 located in Pulaski County, Winamac is a small town. 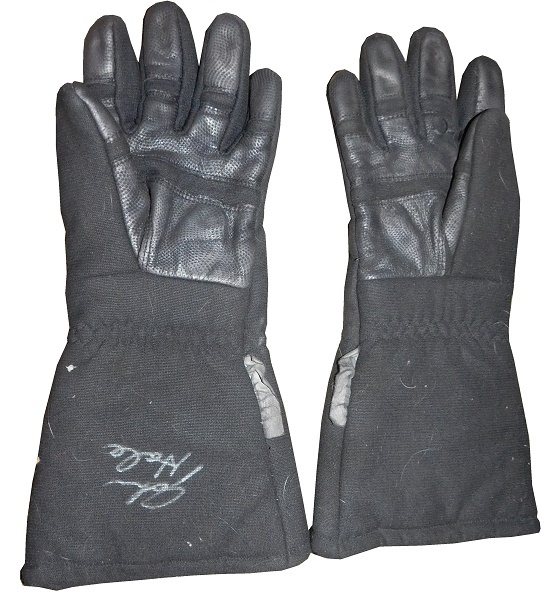 One of their major businesses is BraunAbility, founded by Ralph Braun, a Winamac native. At age six, Braun was diagnosed with muscular distrophy, and at age 14 used a wheelchair. At age 15, he built himself a motorized wheelchair, and modified an old mail Jeep to have a hydralic lift. At age 23, Braun started his company to help make mobility scooters, and eventually began modifing cars and vans for mobility. As mobility scooters took off, The Braun Corporation grew, and eventually became a recognized name in mobility vehicles. 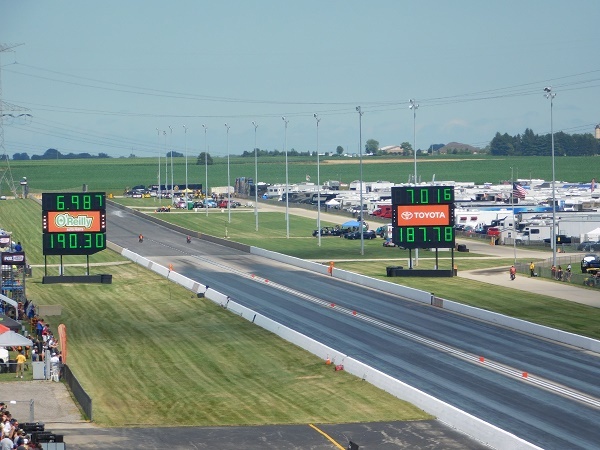 As his wealth grew, Ralph, and his son Todd started Braun Racing. 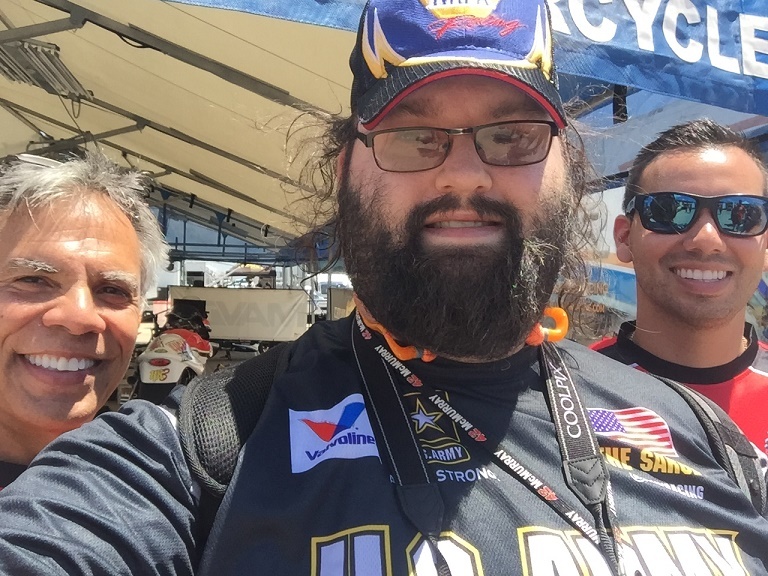 It eventually became one of the bigger Xfinity Series racing teams. Ralph sadly passed away in 2013, having made the world a better place. From 2003 to 2010, Braun Racing was a mainstay in the Xfnity Series. 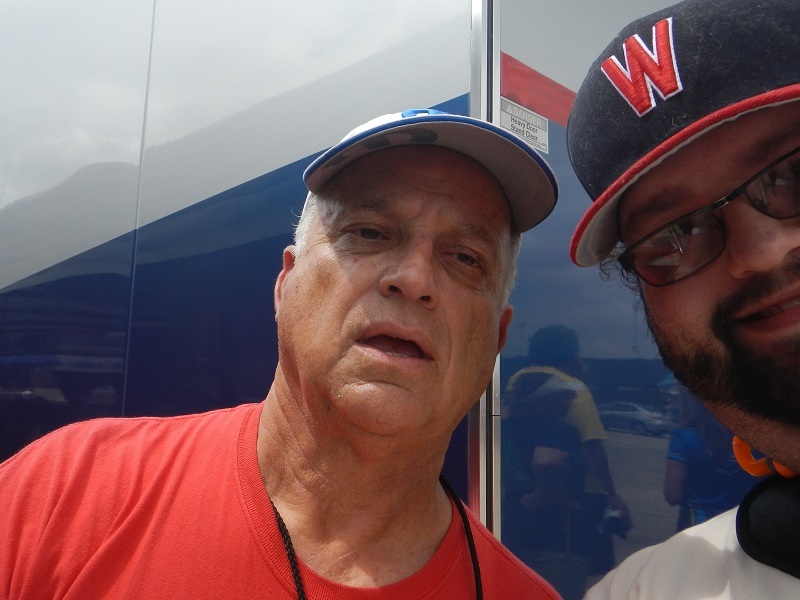 They have, in total, 4 wins, 84 top 5’s, 185 top 10’s, and 13 poles. 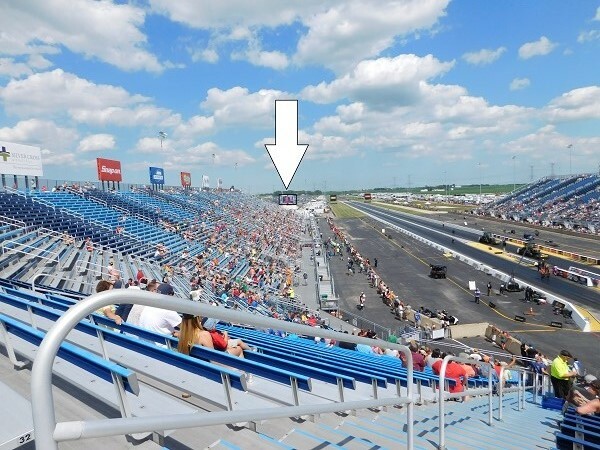 Well known drivers who have raced for Braun include Jimmy Vasser, Casey Mears, Jamie McMurray, Kyle Busch, David Stremme, Ron Hornaday, Jr., Jason Leffler, Michael Waltrip, Todd Bodine, Denny Hamlin, Brian Vickers, James Buescher, Jacques Villeneuve,David Reutimann, Kasey Kahne, and Elliott Sadler. 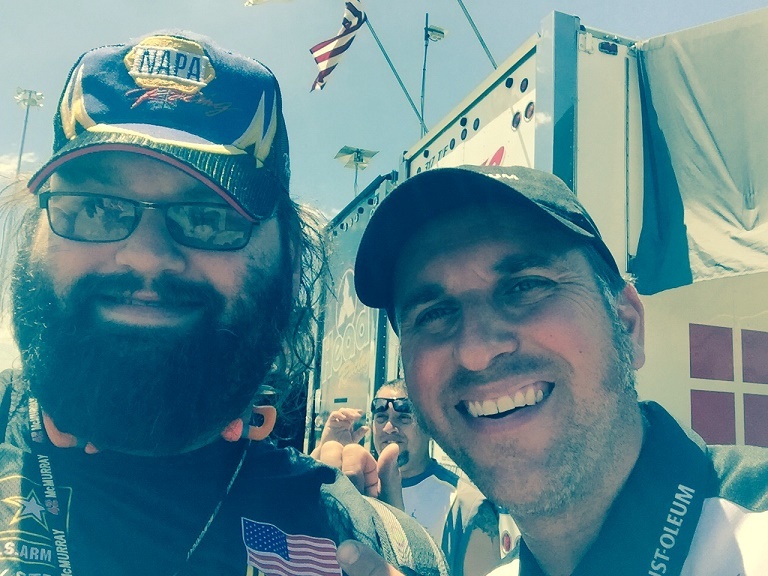 One young driver that used Braun to get to a higher place in NASCAR is Brian Scott. Brian son of Joe “J.B.” Scott, the owner of the Shore Lodge and Whitetail Club resorts in McCall, Idaho, and the great grandson of the founders of Albertson’s grocery store. 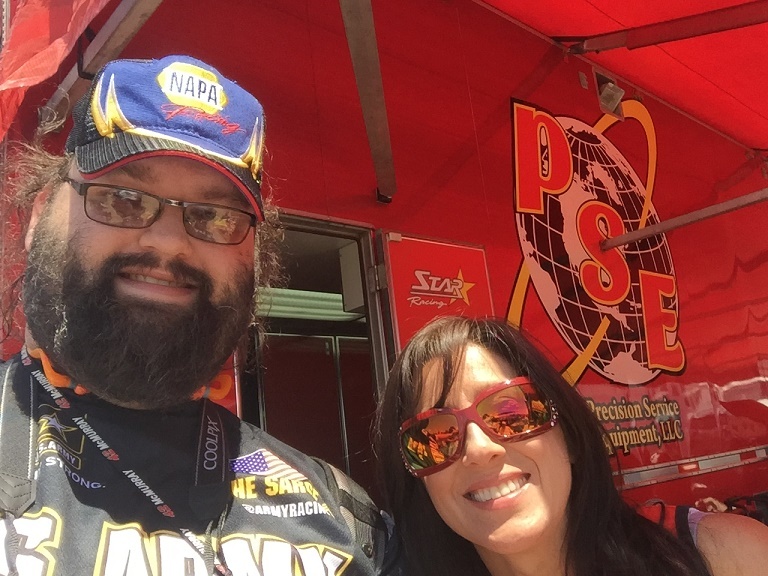 He has raced since the age of 12, racing for his own Truck Series team, Xpress Motorsports, which he won a race in during 2008. 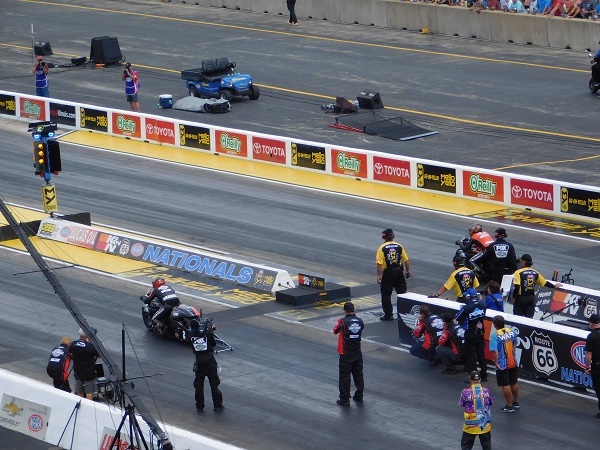 The team would turn in which became Kyle Busch Motorsports, which he won a second race in 2012. 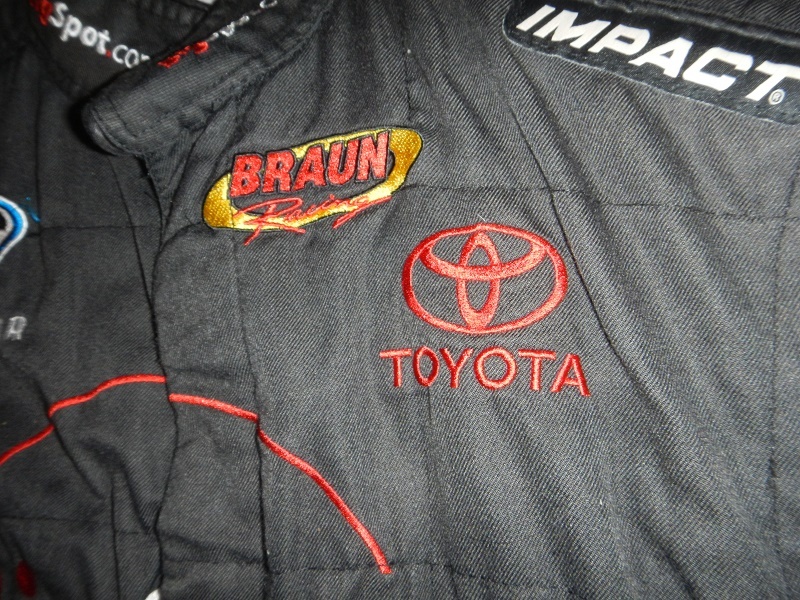 Being a part of a multiple team Xfinity Series team in 2010, Braun and Scott had a series of different sponsors. 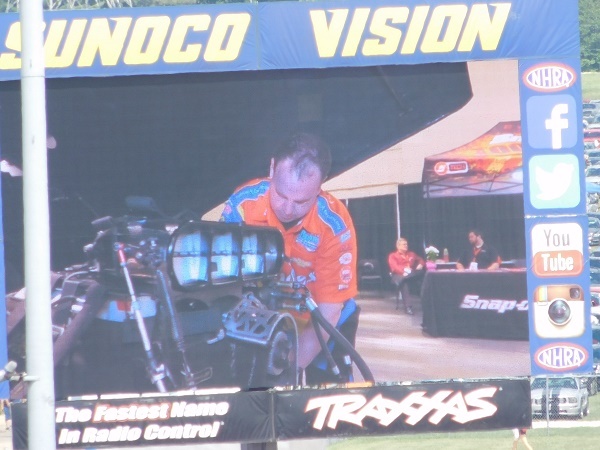 Braun would accept sponsorship from websites of questionable intent. Once such website is BigSpot.com, a market research site that promises that the user will get paid to take research surveys. 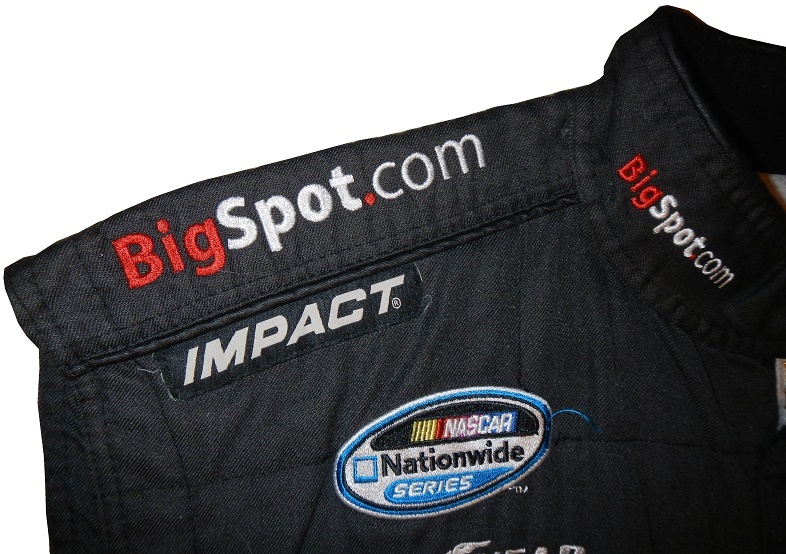 BigSpot.com was on the car for a total of 5 races, Fontana, Road America, New Hampsire, Richmond, and Dover. 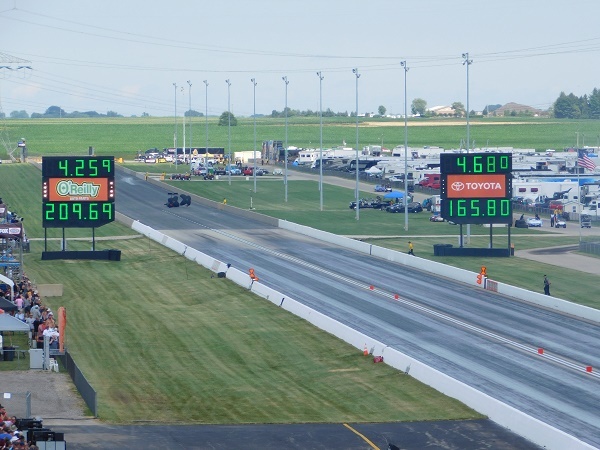 They did not have any real results, not even scoring a top 10, or leading a lap. 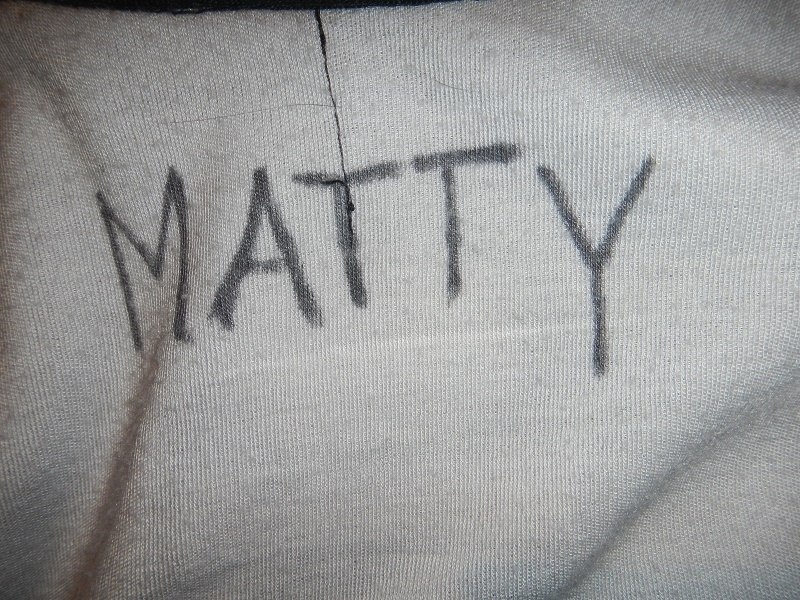 One of the crew members nicknamed Matty was issued this Impact crew vest. 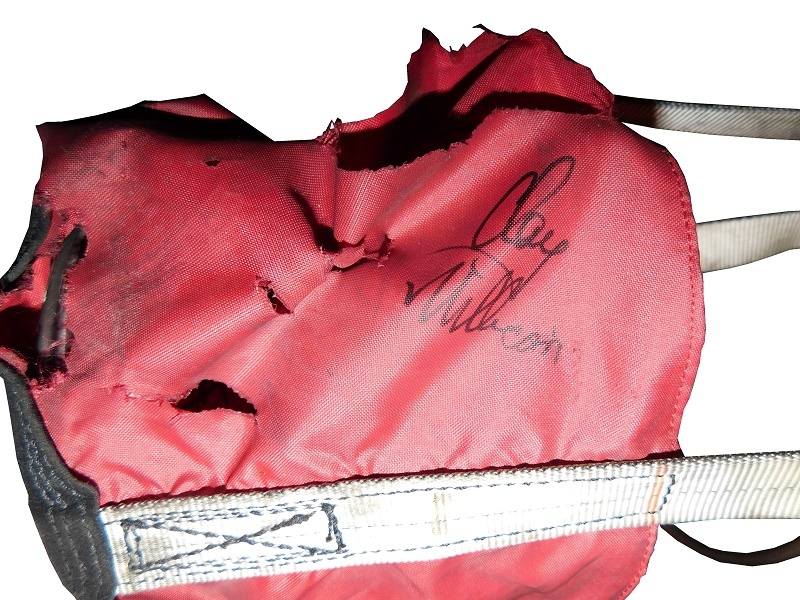 The vest shows light use, having been worn for 5 races out of a possible 35. 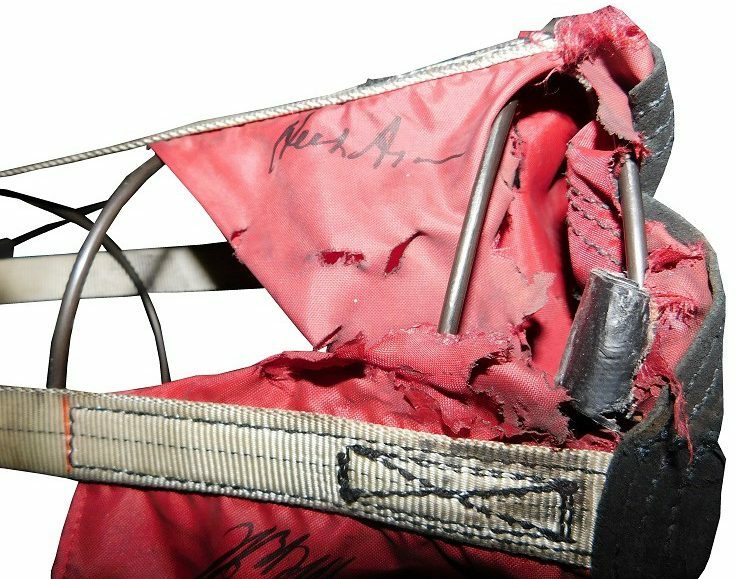 The collar has BIGSPOT.COM logos embroidered into it, and the name MATTY written in Sharpie in the cowl. 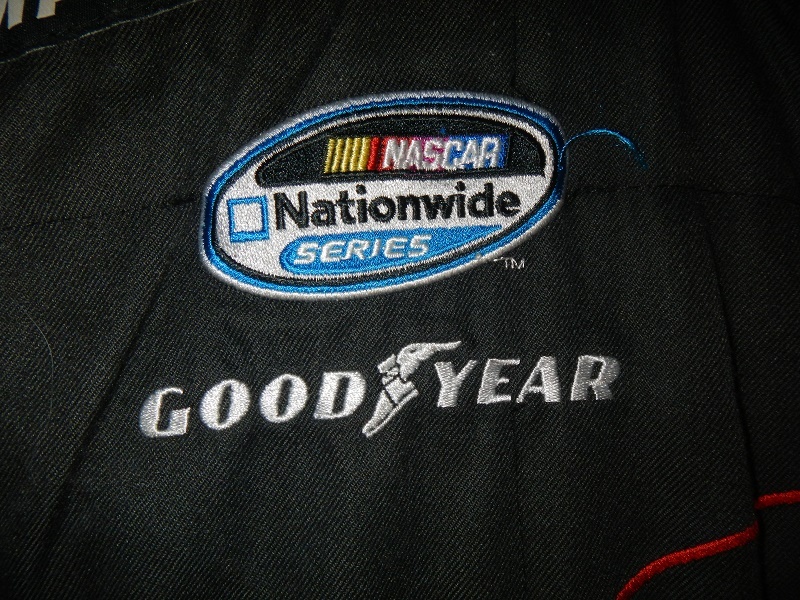 The right chest has NASCAR NATIONWIDE SERIES and GOODYEAR logos embroidered into it. 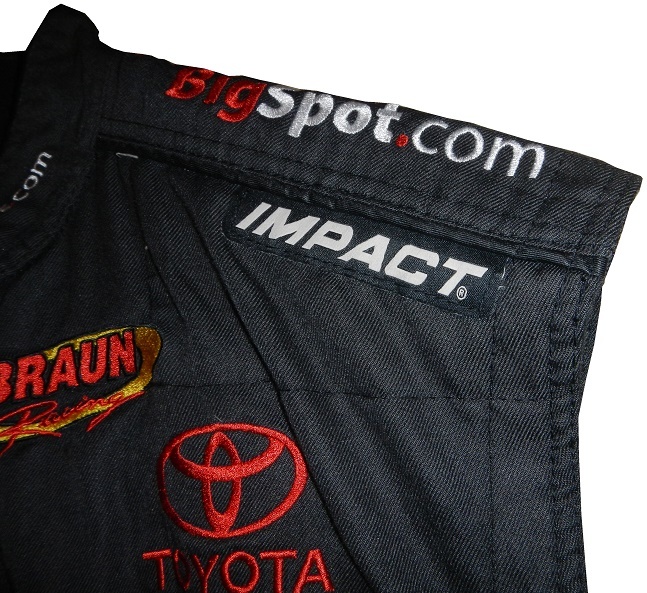 The left chest has BRAUN RACING and TOYOTA logos embroidered. 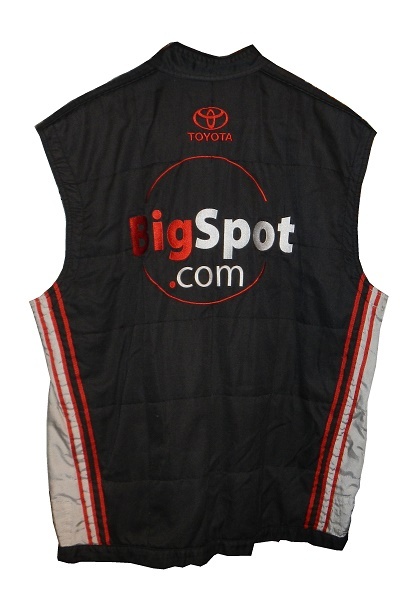 The red and white BIGSPOT.COM logo is embroidered into the black fabric. 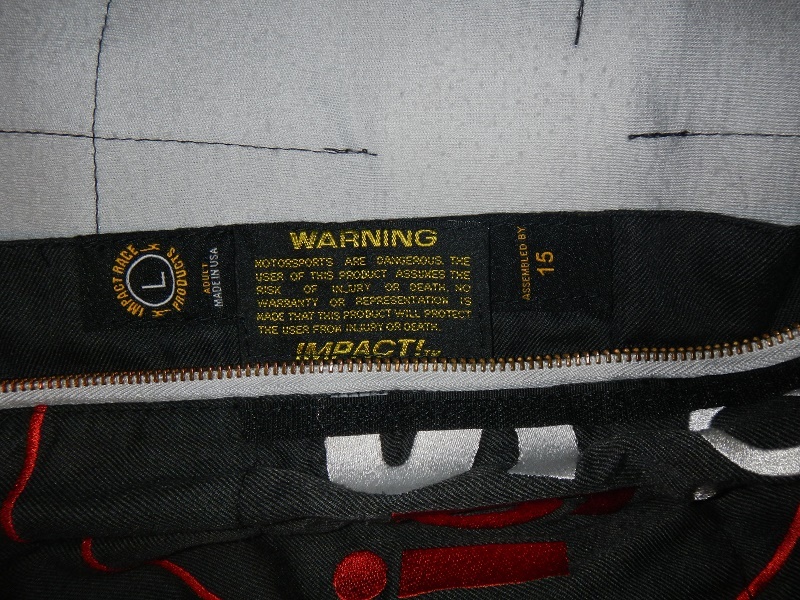 Inside the vest, just under the front logo, next to the zipper is the warranty and size tag. 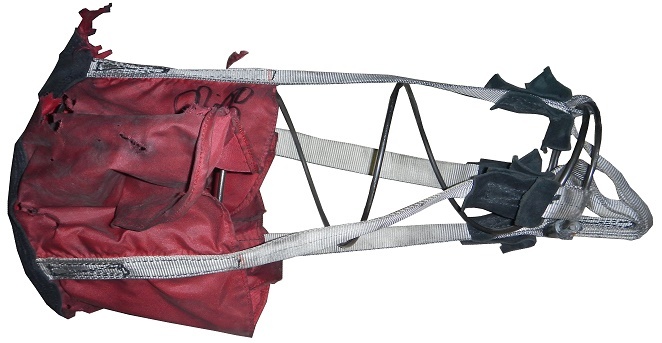 The standard Impact comfort straps are present on the sides. 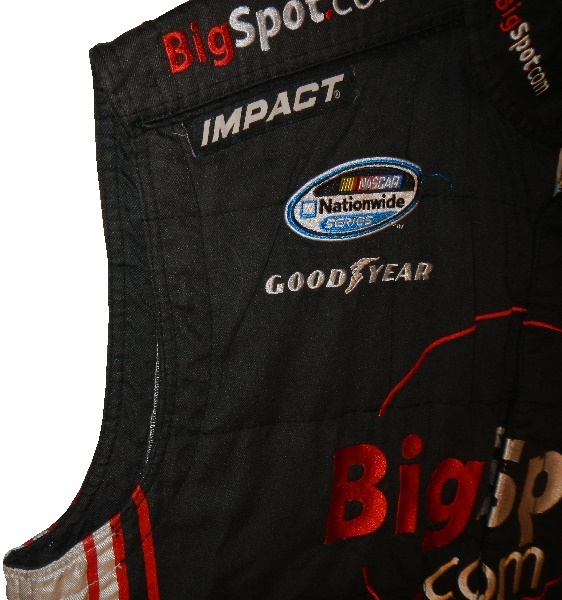 The shoulders have BIGSPOT.COM logos embroidered into it, and Impact logos present, and standard vest holes. 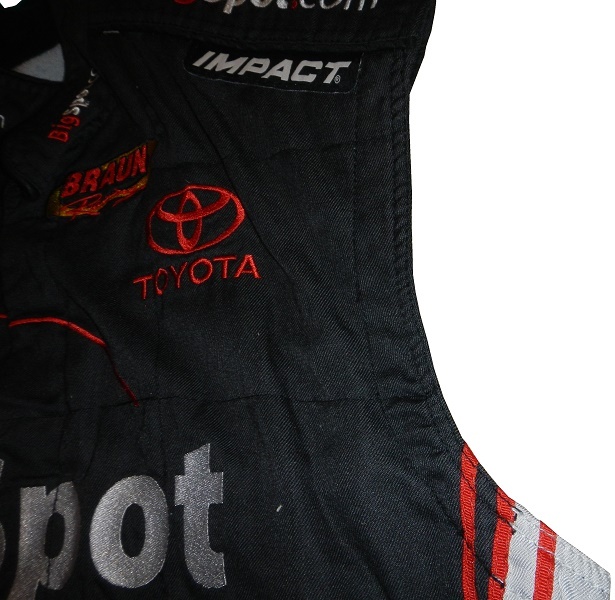 The back of the suit shows some light wear. 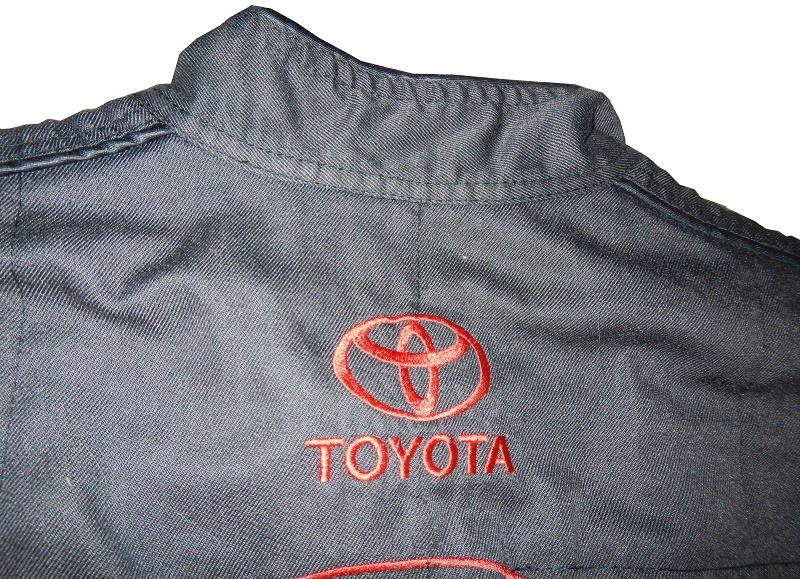 The back of the neck is unadorned, and has a Toyota logo embroidered into it. 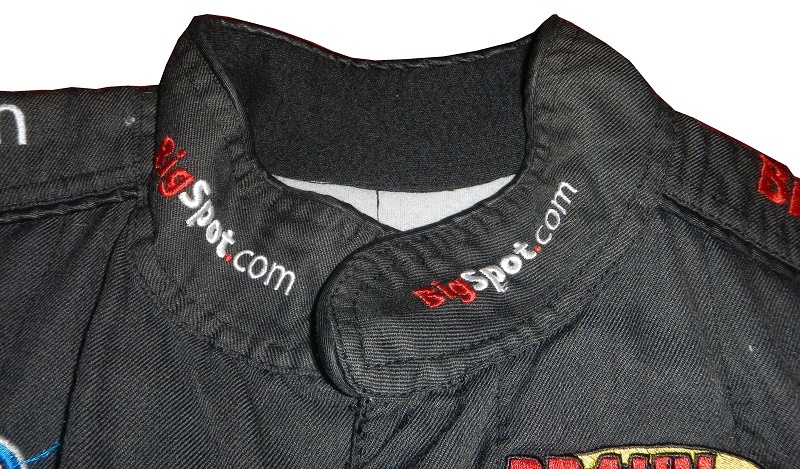 The same BigSpot.Com logo that is present on the front is present on the back as well, but is somewhat higher than the front logo. 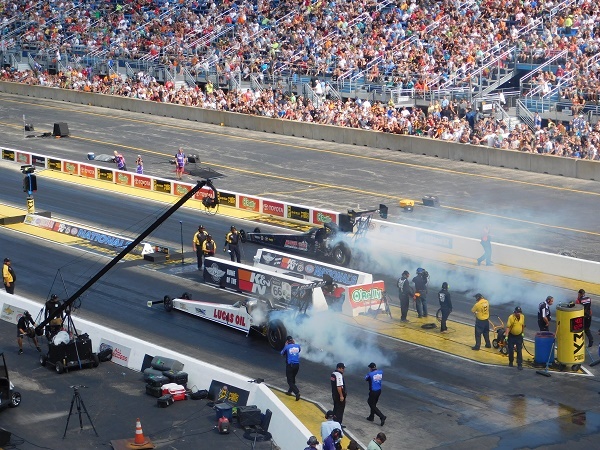 Braun racing is an example of a team that got better as it got bigger. Some of their sponsors are bigger and better. Some of the vests are bigger and better as well. In two weeks I will examine a vest that meets both of those criteria. 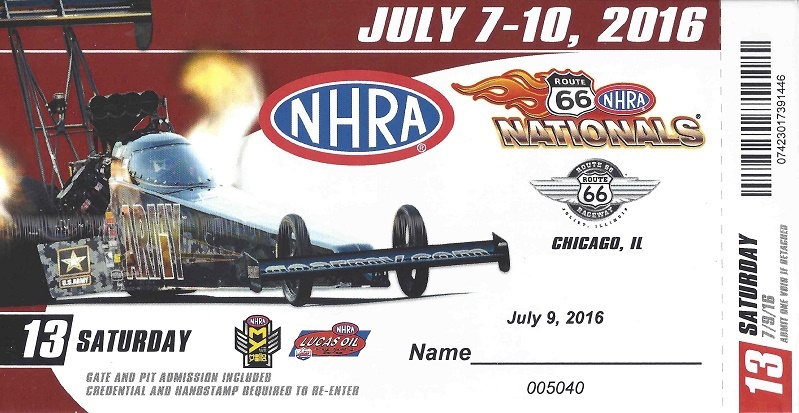 This weekend, I’m going to the NHRA Route 66 Nationals, and I will discuss that next week.